Time is passing by fast. We’ve been here (Mesa, AZ) two months and it seems like we haven’t really been doing and going much to truly enjoy the beautiful weather (sorry north friends). But as we look back on some of the few pictures we’ve taken, we can see how we really have taken advantage it. 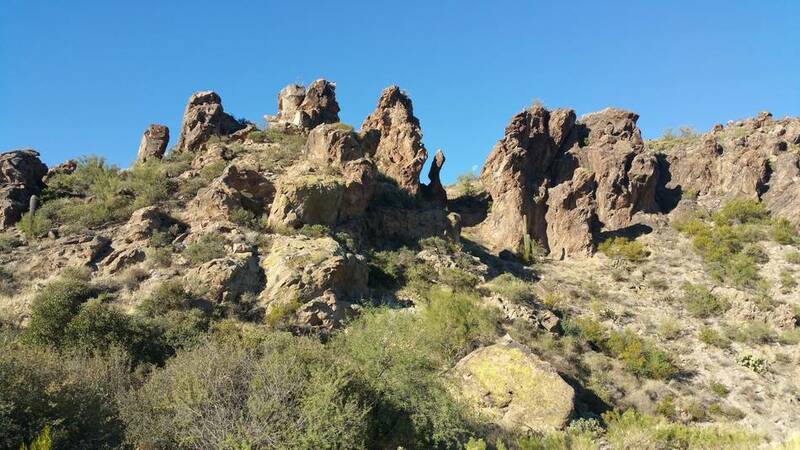 On December 7 we hiked the Lost Dutchman Trail in the Superstition mountains. Got a cool picture of a formation with the moon poking through. Look close, it’s there. Roland had been on this trail several times and was eager to show us the way to the Lost Dutchman’s gold (failed to find it of course). Susan and Ed tagged along reluctantly, but Connie was eager, as usual. It was a great day…Roland drove us to the trailhead; and Susan provided a tasty bowl of split pea soup on our return. Is that an oxymoron…tasty split pea soup? 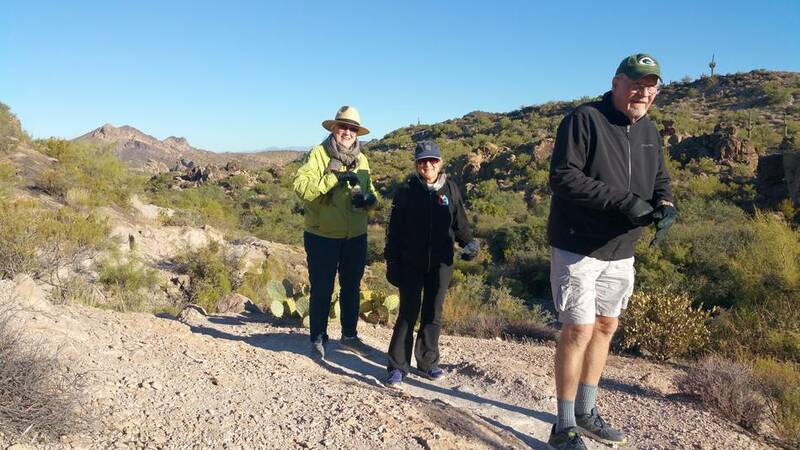 Connie hiked South Mountain with sister Carol and hiking friend Kerry on December 11 and we were in the groove of walking a 3 mile stretch of the canal path in early mornings with Roland and Susan…They got sick and had to hold back, and Connie’s ankle was started to give her problems. So our walking routine is on hiatus right now. Oh…but we did walk a block to McDonalds for an ice cream cone. Sunday after church December 10, we took a lovely trip through Payson, Cottonwood, and Sedona to Harding Springs, primarily to get our water jugs filled, but to enjoy the journey and ever changing beauty of the Arizona landscape. 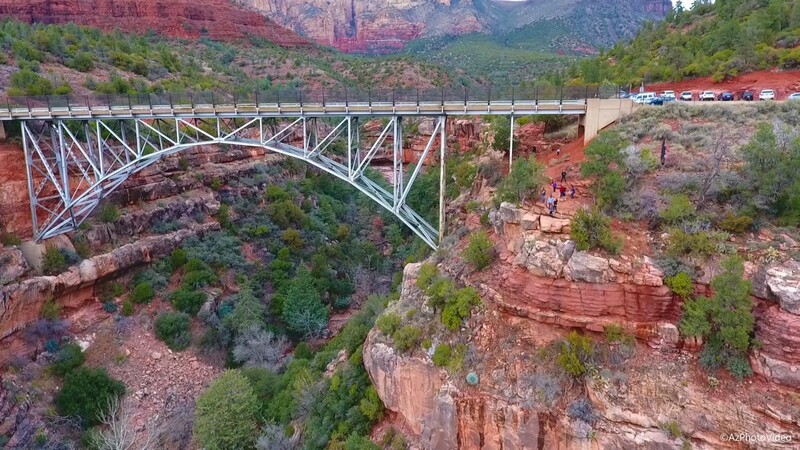 The Sedona area is illustrious with red rock formations and picturesque views, like the Midgley bridge, gateway to Oak Creek Canyon, in route to Harding Springs. We haven’t seen many quail come by this year…at least not yet. 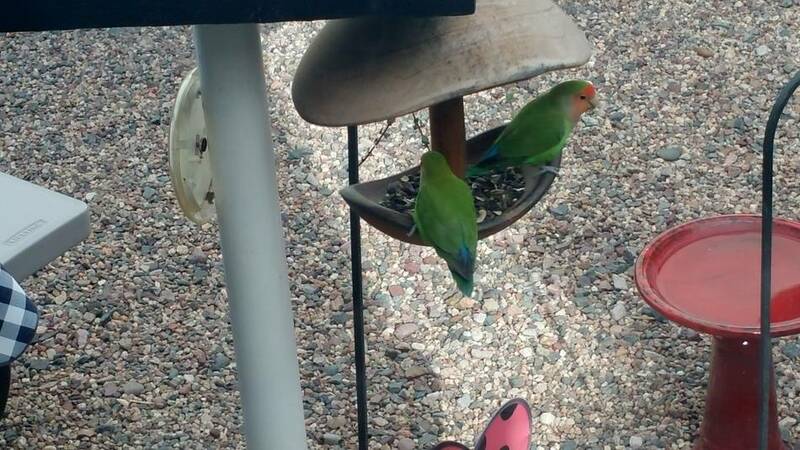 But we did have a visit from some Rosy-faced Lovebirds (Agapornis roseicollis). Reportedly these fellows were first sighted in Arizona in the eighties. There were actually three that came by. Geez. What’s this? Fishing the canal? 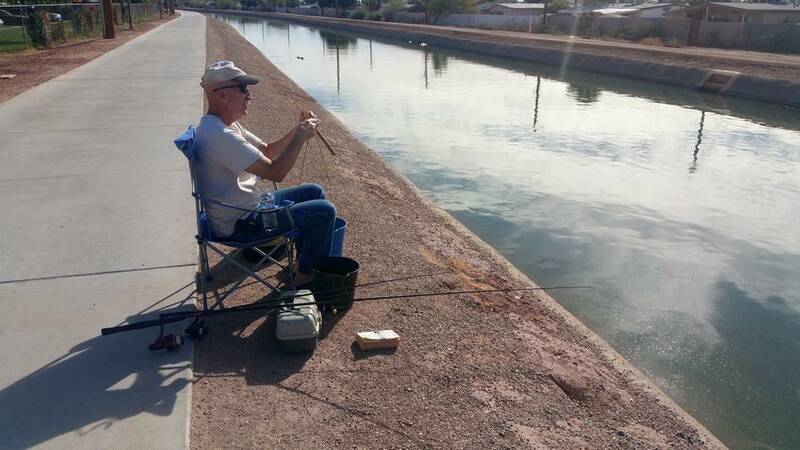 Yep, that’s our old Twin Palms pal, Don, evermore fishing for carp! Yes folks, carp. 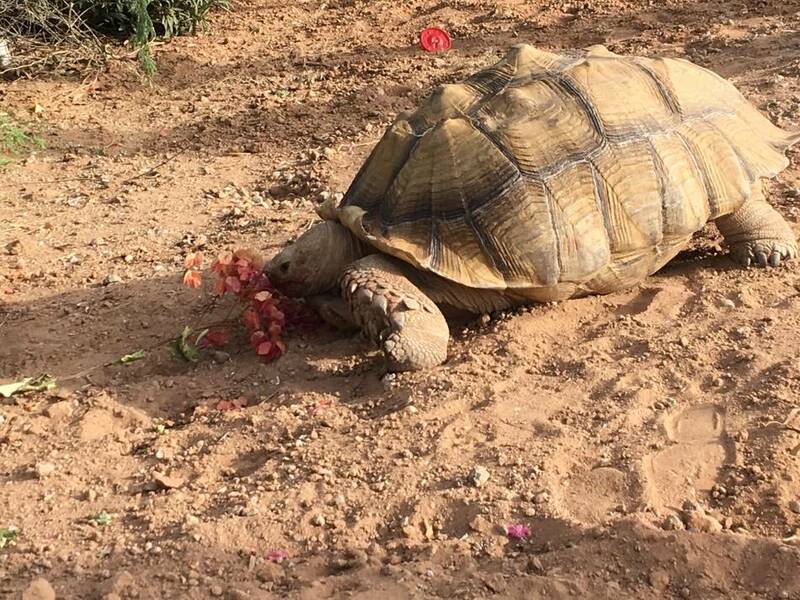 He doesn’t keep them, or eat them…just releases them back into the canal. Why? You’ll have to ask Don I guess. 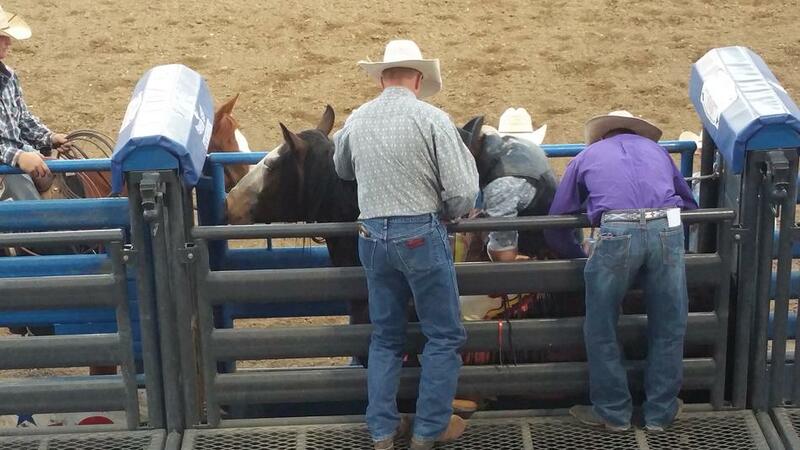 It is convenient for him though, just a few steps from his trailer and out the gate. 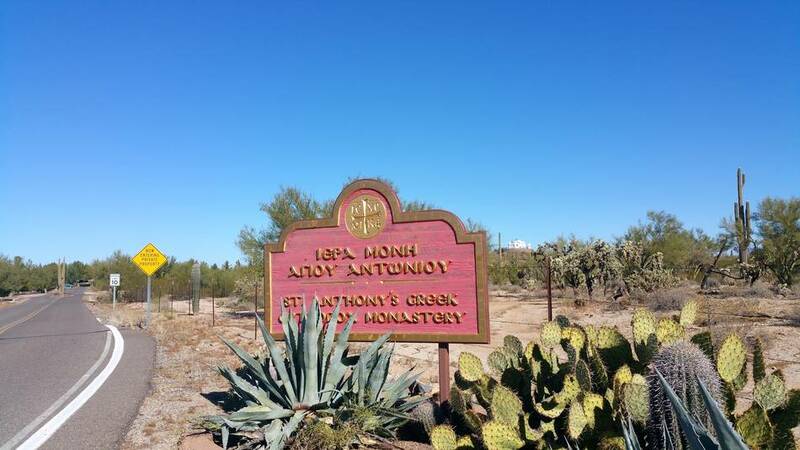 A recent highlight of our life in Arizona was a trip to St. Anthony’s Greek Orthodox Monastery near Florence…about an hour away. Note St. Elijah Chapel just to the right of the entrance sign. Sister Carol and husband Roger were our guides as they had been there before. 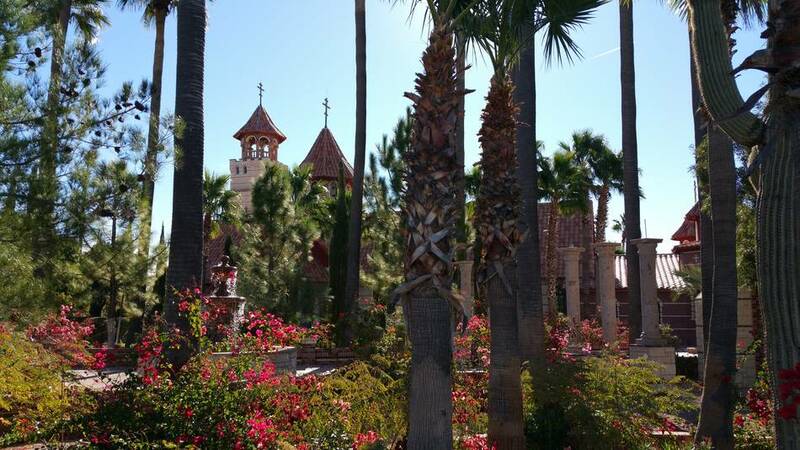 The first thing we see when entering the grounds is St. Anthony’s Church. The inside is quite ornate with many pictures of saints and mosaics. 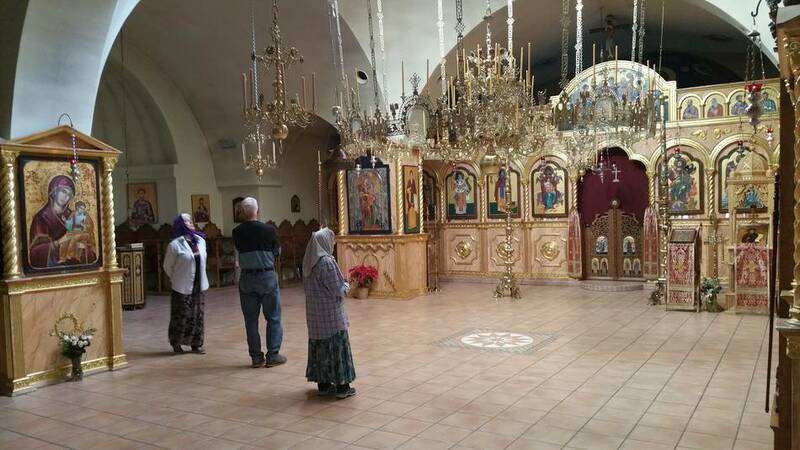 Note the humongous brass chandelier where candles represent the “heavenly church.” There are no lights (except for 2 small ones on the chanter stands). No chairs! Nearly everything is from Greece. Carol, Roger, and Connie stand in amazement as they look around at the incredible fixtures. In addition to the church, there are 5 chapels. The monks will not allow anyone on the grounds if they have any skin showing other than face and hands. Women must wear a head scarf as well. The men must wear long sleeve shirts. No sandals. Fortunately, they have a supply of loaner clothing. The monastery was established in 1995. It is absolutely incredible what they have done to the property in the few short years since. 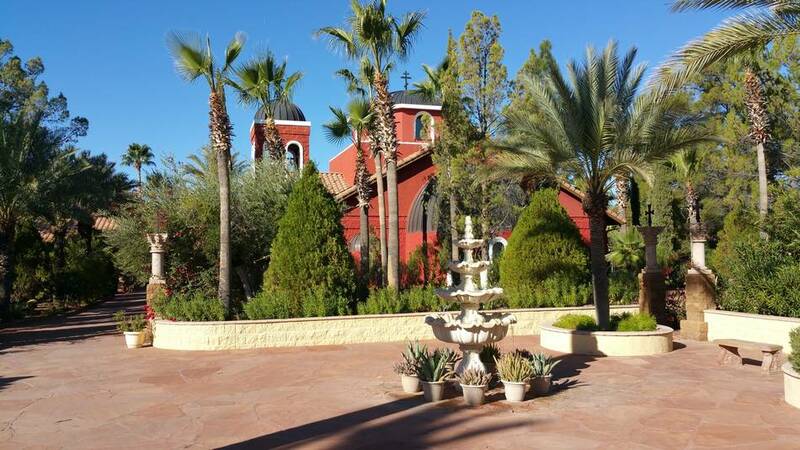 The grounds, fountains, and chapels make up a lush oasis in the middle of the desert. 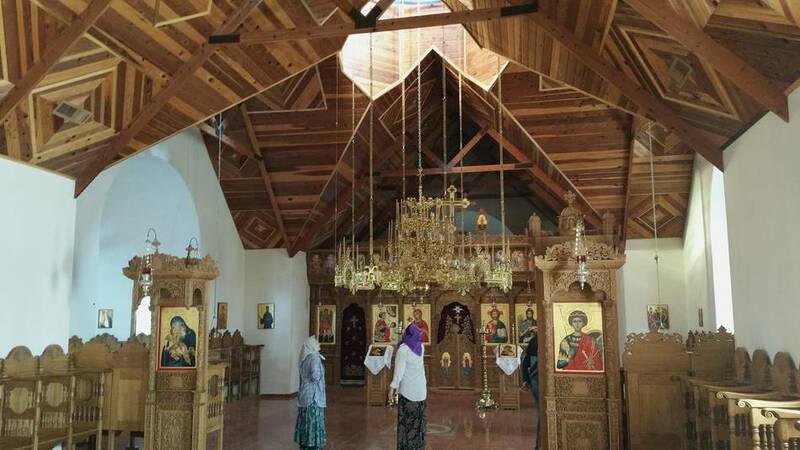 The interior of one of the Chapels appears very similar in design to the main St. Anthony Church, yet somewhat smaller and exhibits an artistic incredible inlaid wood ceiling. St. Elijah Chapel, the newest and fifth “chapel”, is still under construction, but attacks the eye’s attention from it’s hilltop setting. Each of the chapels, as well as the monastery itself, have deep rooted history from the early Greek church. 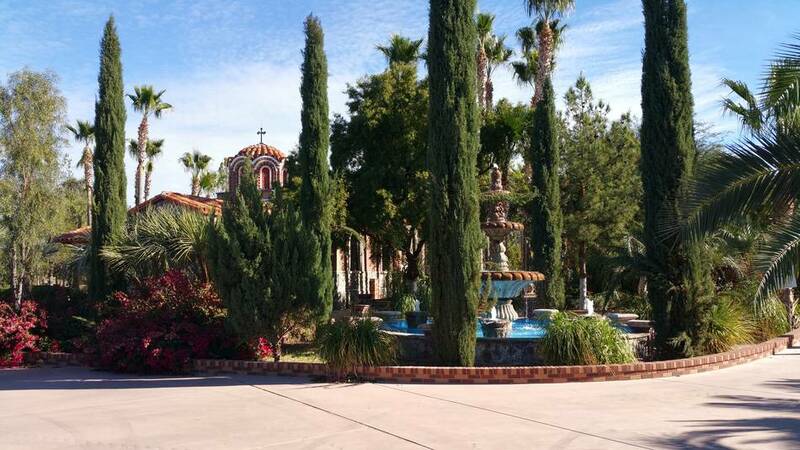 While we don’t attend a Greek Orthodox church, we could be accused of church hopping when we’re in Arizona. We first attended Harvest Chandler, then moved to Harvest East Valley, and we currently attend Christ Church in Gilbert. Actually, they are all the same church, just moving, growing, and renaming. Loving the music and the Bible based messages that dig in to the Bible. We miss Foundations in Loveland, but love Christ Church too. We pulled out of Bear Creek Lake, Indian Paintbrush Campground in Lakewood mid-morning Friday October 27, 2017 and traveled the short distance to Cheyenne Mountain State Park in Colorado Springs. A wonderful park across from a Fort Carson Army Base entrance. Stayed here one night so we could attend Faith’s volleyball games that afternoon. Our site had a fantastic view of the valley. We left Cheyenne Mountain SP just before sunrise on Saturday and began our trip back to Stephenville, TX to visit sister Alice and family. We stopped overnight at the Canyon, TX Walmart. Canyon is just south of Amarillo. 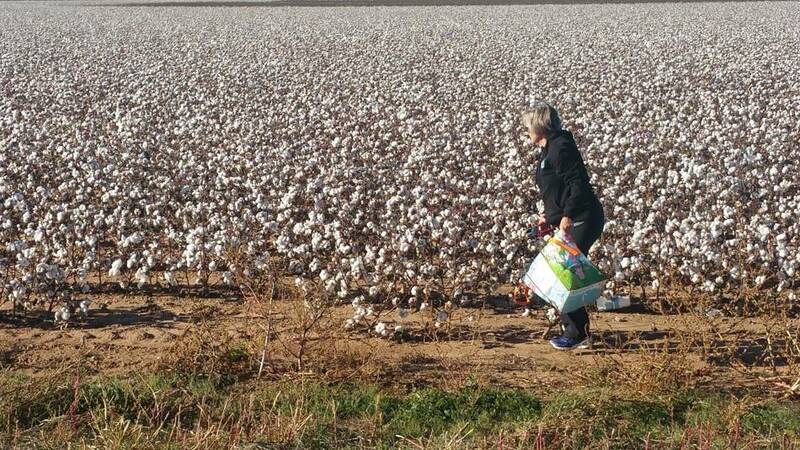 We left early Sunday, making an emergency stop to gather cotton decor while traveling US 84 somewhere between Post and Sweetwater. After a brief visit with our Stephenville family, which overlapped Halloween (no costumes were needed), we got an early start for our 600 mile trip along I20/I10 across West Texas to a Las Cruces Walmart. A great stopover point. 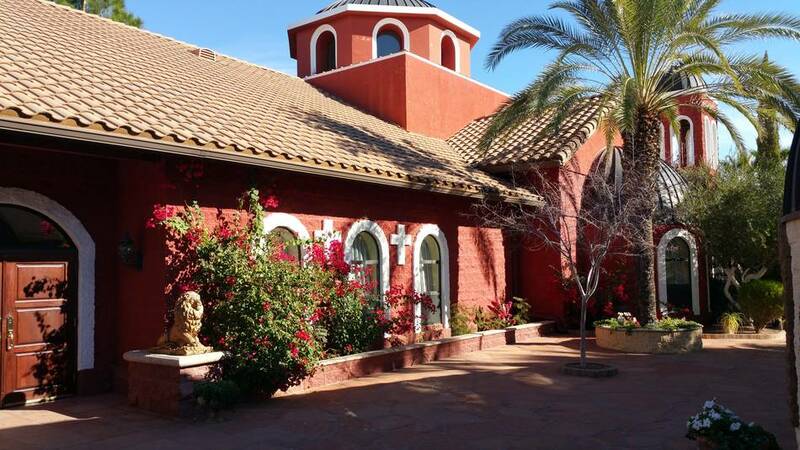 We walked about a mile to the Paisano Cafe for a delicious dinner. 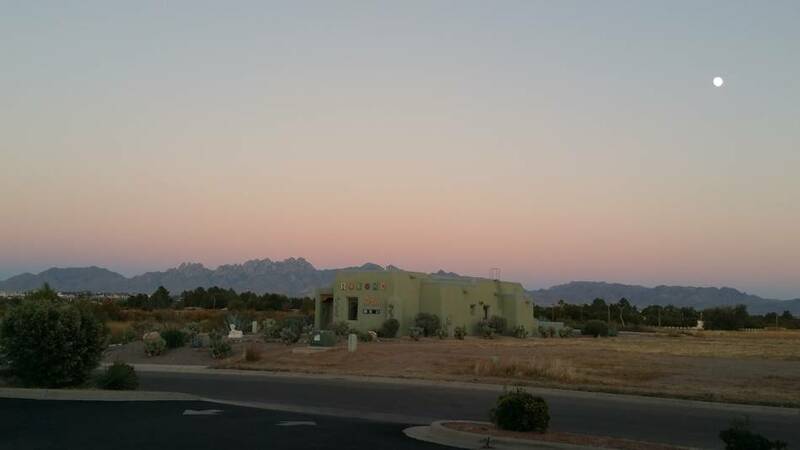 A fantastic night for a walk and enjoying the beauty of God’s creation of the Organ Mountains at sunset. 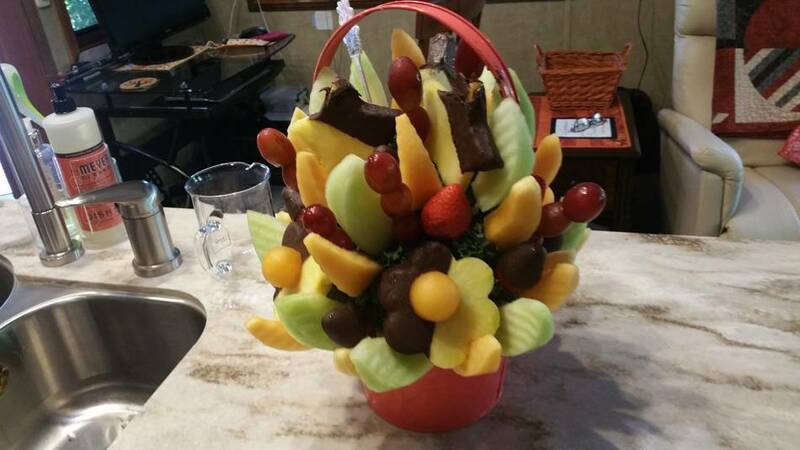 We drove the final 400 miles to our winter home (Twin Palms RV Park) on Thursday November 2, stopping at Blue Beacon for a trailer/truck wash. We were cheerfully greeted by Jenni and Steve with a fruit basket. They were most ready for us to arrive and take some of the park management pressure off. 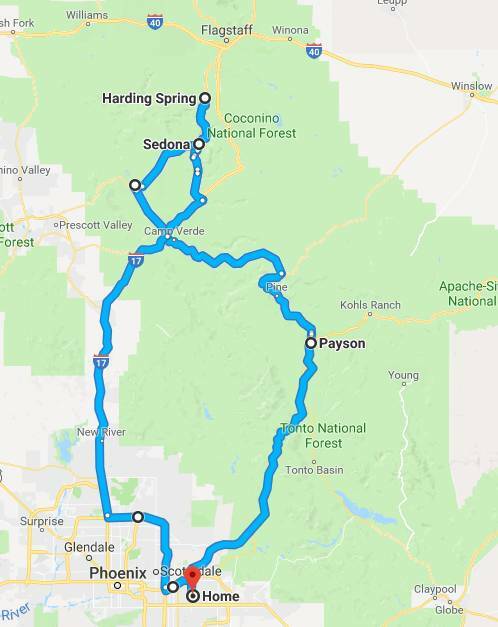 Since we’ll be here through most of April, we decided having a car, rather than the dually beast, would work much better for tooling around the area. 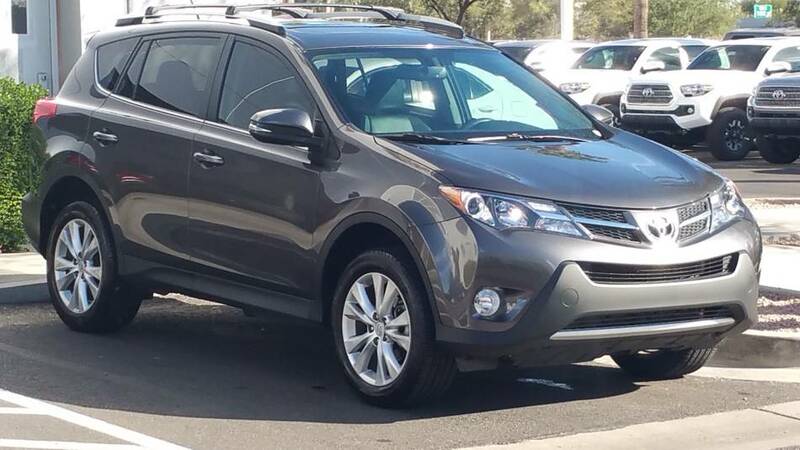 We were originally thinking of just getting a cheap “beater” to get around, but managed to swing this 2013 Rav4 the first week here. Connie Loves it. Ed has only driven it once, riding his bike to Home Depot a lot. Getting settled in our great little abode. 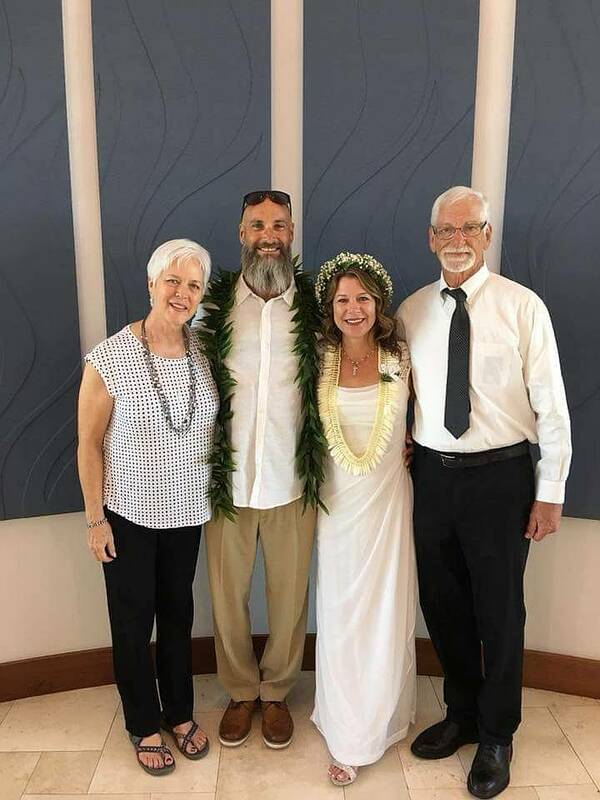 We attended the blessed wedding of Kevin Sauter and Amanda May on Saturday November 11. Kevin is Brother-in-Law Roger’s son. It was a quickly planned, yet fantastic wedding and reception. Newly certified Roger performed the ceremony. Roger’s wife (Connie’s sister) Carol joins in the celebration and joins in a picture. 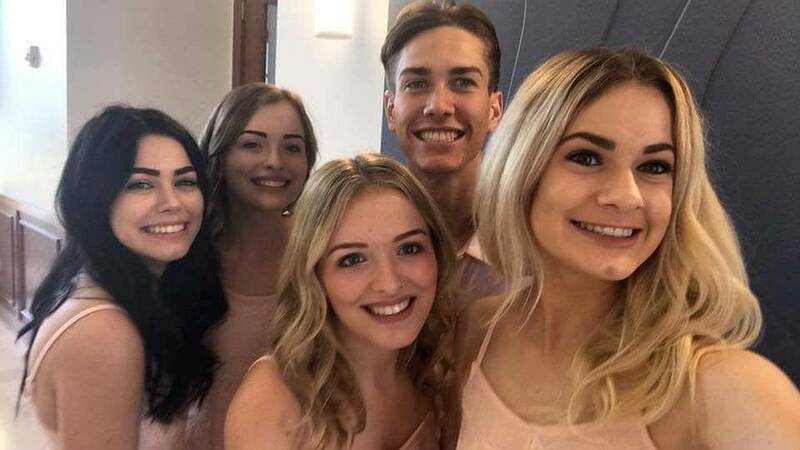 Kevin’s son Ryan and daughter Jenna (far right), along with Amanda’s twins Rachel and Maria, and oldest daughter Nina are all one family now. Five children (five 1’s in 11/11/17) plus Kevin and Amanda make 7 (as 111117). How quaint is that? 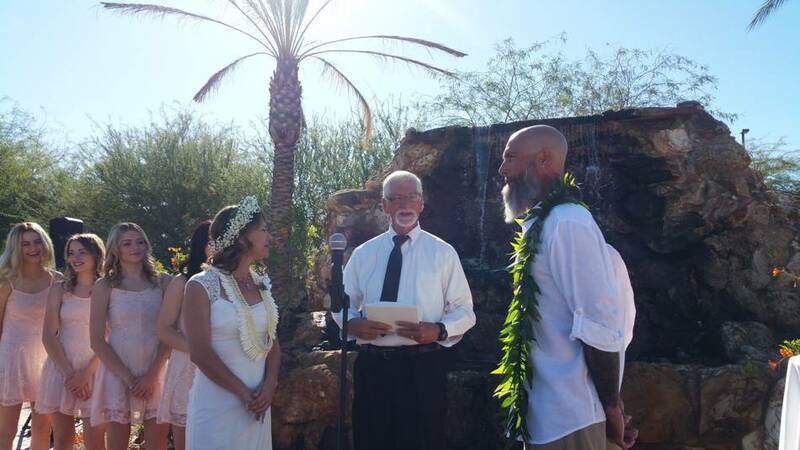 Roger and Carol are very involved here, including serving as head ushers and Sun Valley Tempe. 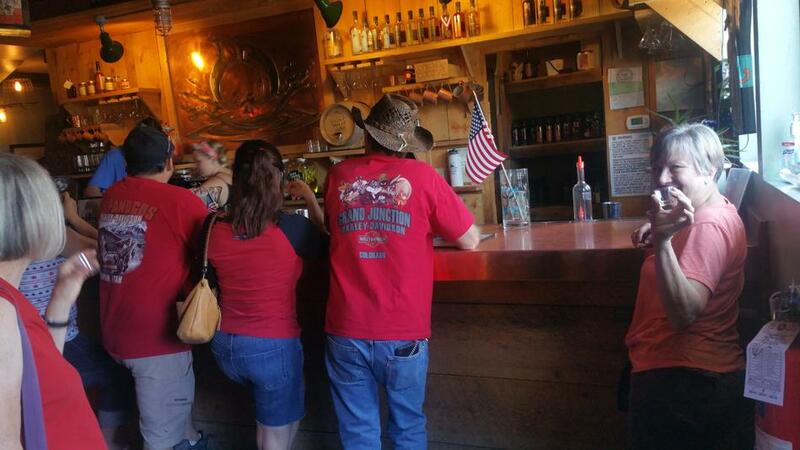 The natural thing to do after church, of course, is head over to Dierks Bentley’s Whiskey Row in Gilbert. 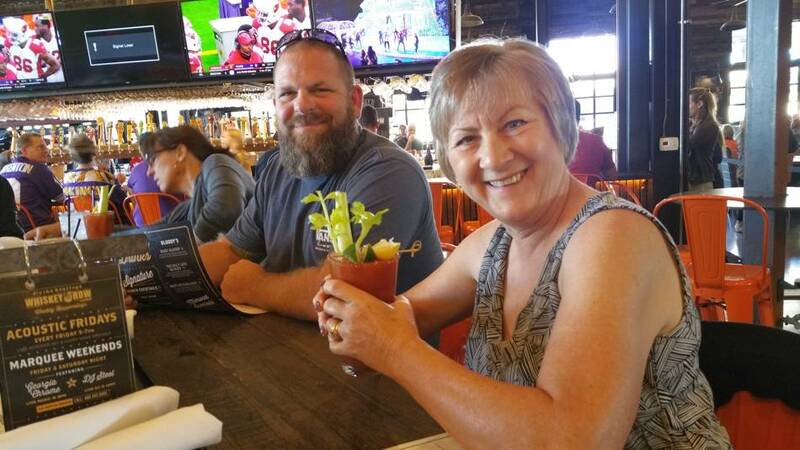 Connie enjoys her Bloody Mary for breakfast. Oh that girl. The place is quite an adventurous experience, but a little loud for Ed. 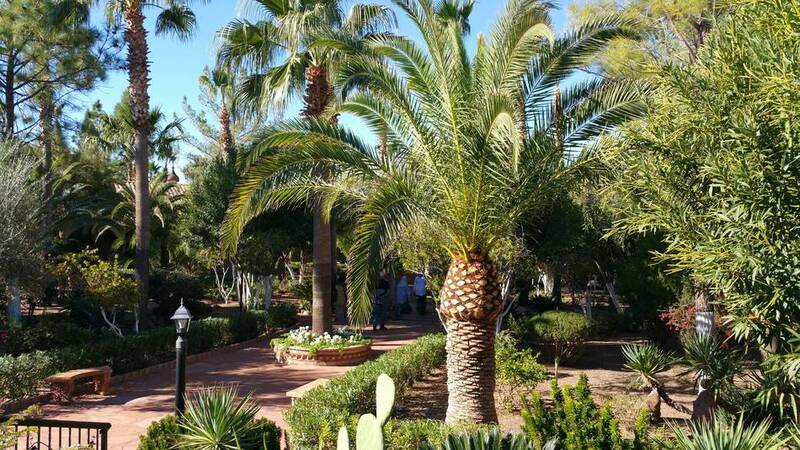 Otherwise, we keep quite busy here at Twin Palms. 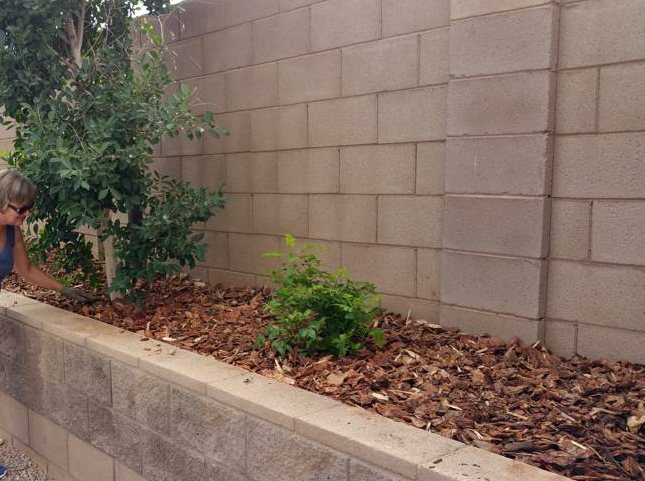 We just re-planted and mulched the bed along the west wall. Ed keeps the pea gravel raked up in the spaces and is busy with general maintenance stuff; Connie cleans restrooms once a week and cares for all the flowers. We both fraternize with the residents here. 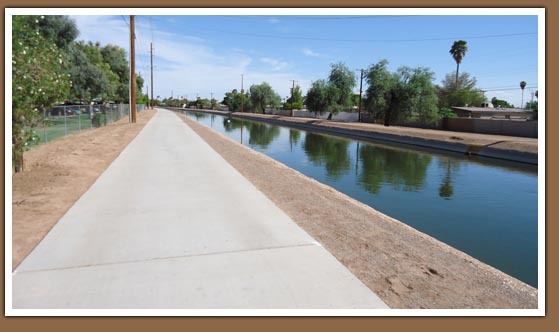 A Twin Palms RV Park gate leads directly out to the Consolidated Irrigation Canal and walking path. Low and behold, Ed saw this tortoise along the path. Surely not out of the canal! It turns out that he (she?) got out of his yard and escaped! 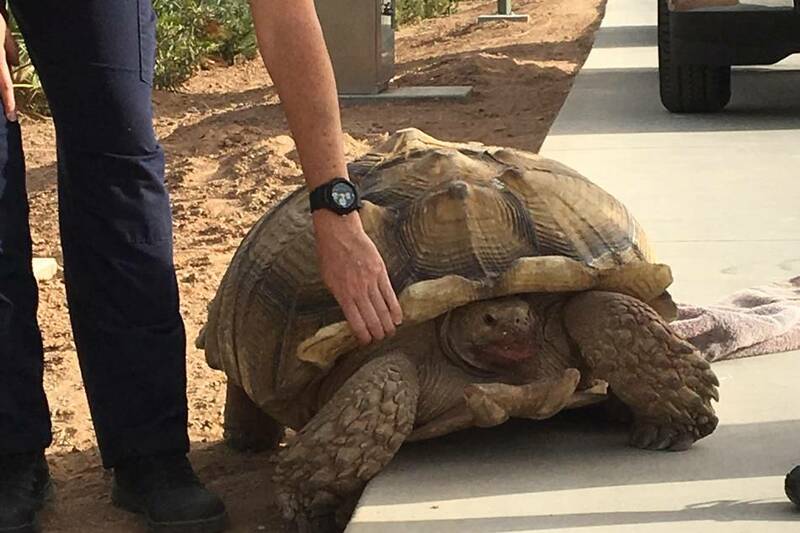 Animal Control had quite a job getting him off the path. Thursday, October 26, 2017: Beautiful sunrise this morning here at Bear Creek Lake Indian Paintbrush Campground. A peaceful 50° degrees. But flakes of snow and dropping temps this afternoon. It was 84° yesterday at this time (4pm) and 34° today. Supposed to get down to 18° tonight. Maybe we’re leaving a day late? 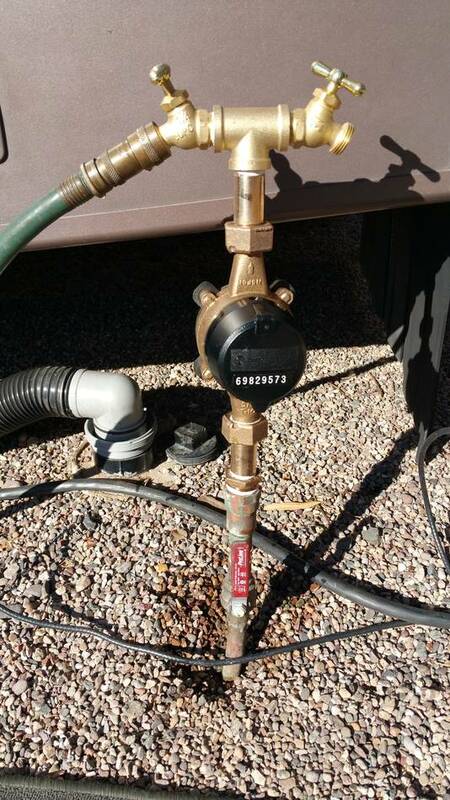 Will pull out first thing in the morning, but only as far at Colorado Springs. Two more volleyball games Friday, then we’ll continue on south Saturday. Halloween with Ed’s sister Alice and family in Texas, then on to our Winter headquarters in Mesa, AZ. Refer to our winter temp address in the margin. We attended many Lakewood High School Volleyball games during our stay here. 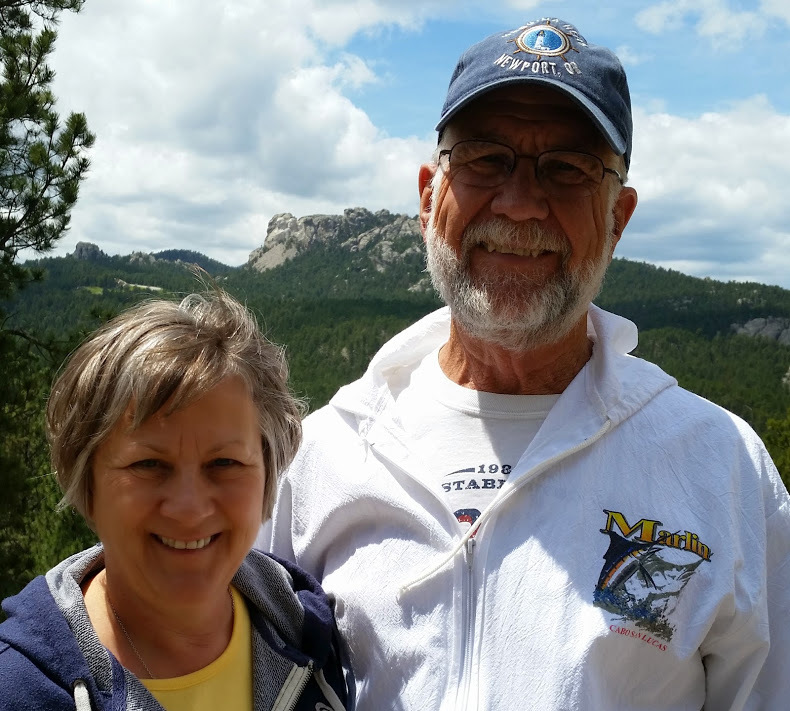 Ed drove a few times for Grace Coach Lines, including Kari’s bus Clifford to the Stanley Hotel in Estes Park. Pays the rent he says. Any shopping from our space at Bear Creek is quite a drive, but a pleasant bike ride up…up…up…up to Home Depot on a concrete path. Ed rode it 2-3 times. There is quite a view of the area once reaching the top of the ridge. Zoom in enough, you can find our trailer. Red Rocks Amphitheater in the background, as well as Bandimere Speedway. 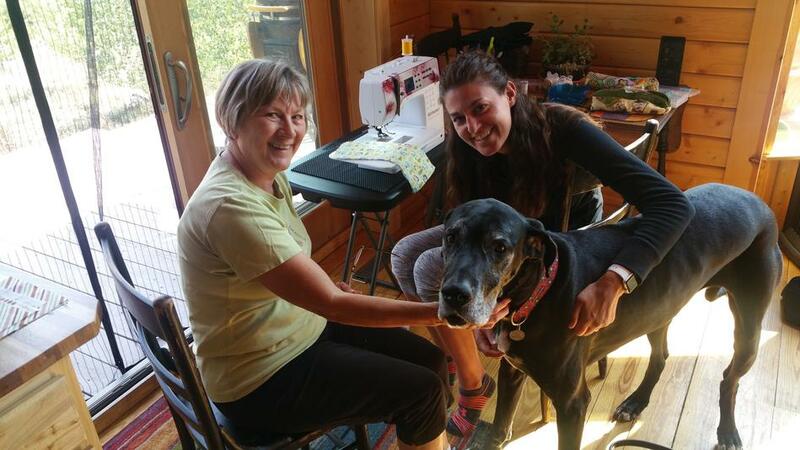 After Connie introduced Angie to sewing when we visited her and Brian in Fraser on Labor Day weekend, she acquired a new passion. 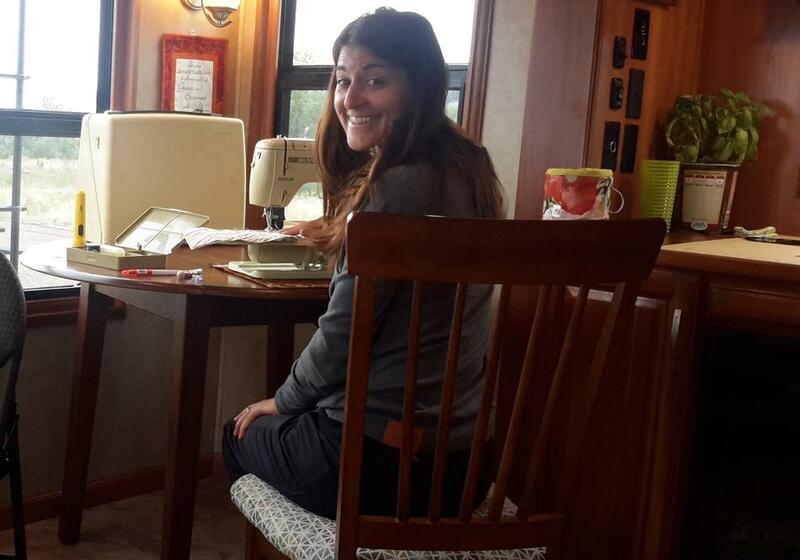 She soon bought a used Bernina (what else) 707, circa 1969, then she made a trip to our digs at Bear Creek Lake for sewing 101 with Connie the following Saturday. While Angie passed her sewing precursor intro on Connie’s machine during our visit there, 101 was a good for her to get started on her own. Yeah Angie! 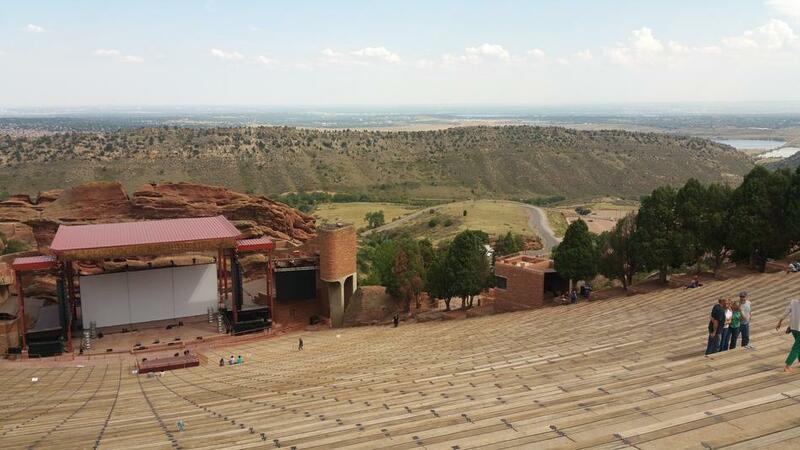 While our campground is not convenient to shopping (maybe 6 miles to a shopping center), it is very close to Red Rocks Amphitheater. 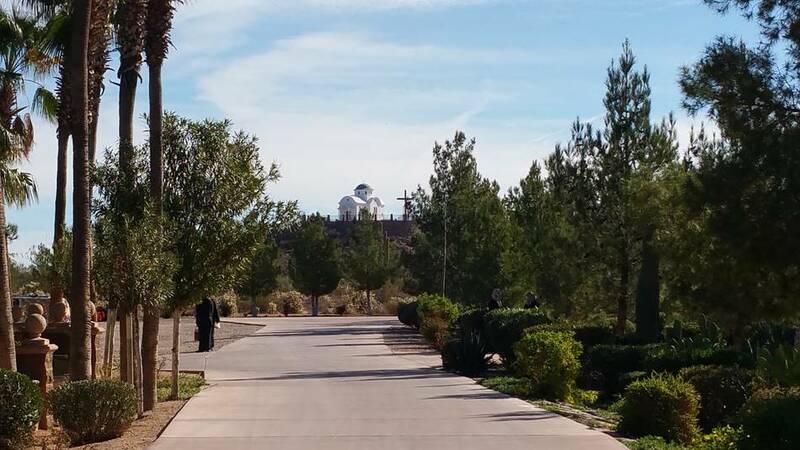 In fact we can see it at a distance from the park. 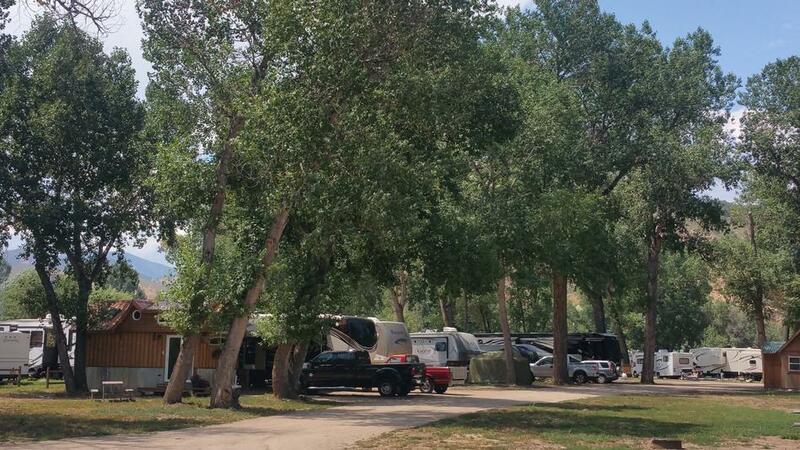 The campground is also across the C470 highway from Bandimere Speedway and the little town of Morrison. We rode our bikes in to town a couple times for breakfast. Connie went with Jodi Gawf to see Chris Tomlin at Red Rocks, and we can often hear the motors revving up at the speedway. 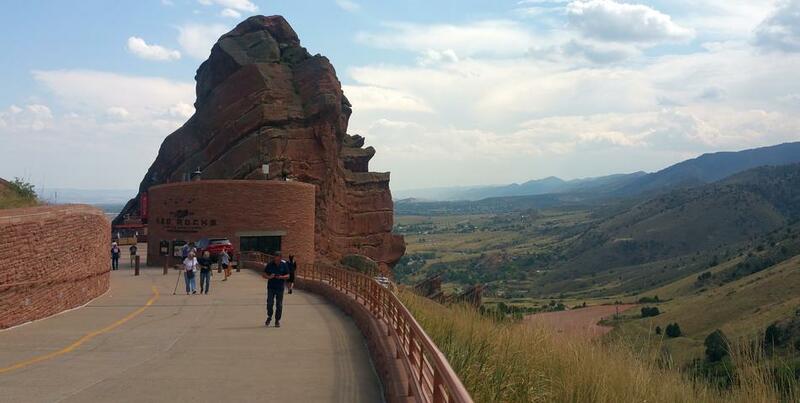 Red Rocks is absolutely outstanding. Highly recommended for anyone to visit, not only to see the engineering foresight that went in to it, but the newly added (circa 2001) museum underneath. Incredible! Lots of pictures and history of so many entertainers through the years. Best of all…it is free to visit and the views are fantastic! 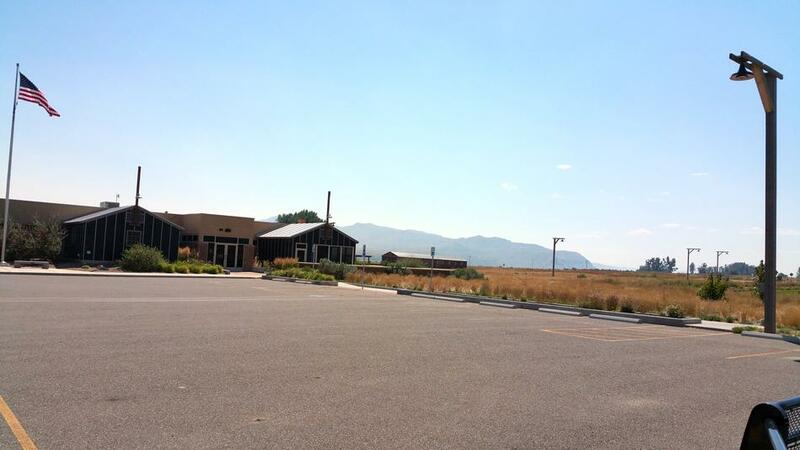 The Archery Range and horse stables are a stone’s throw from our site, and we ride or drive by nearly everyday. The stable rents saddle horses and provides wrangler led trail rides…for only $40/hour! 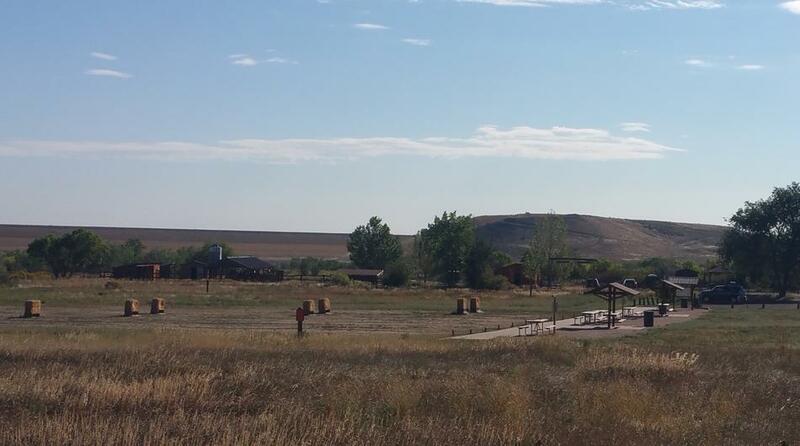 The archery range is free to use for anyone with a day pass, which is needed to even enter the park. 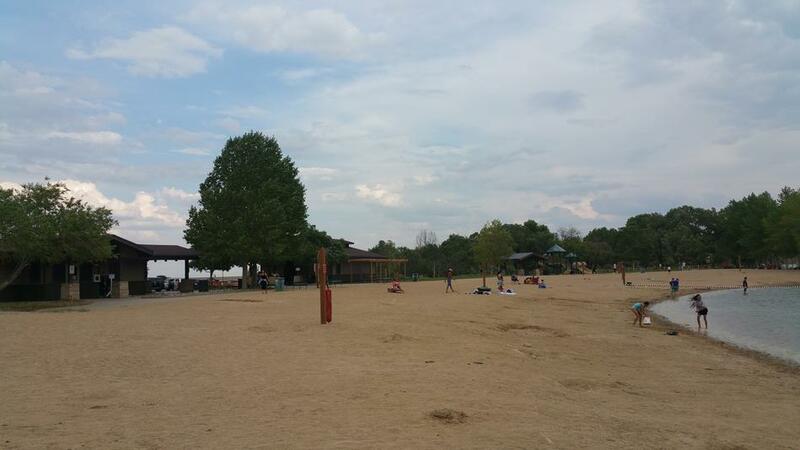 Bear Creek Lake Park offers a very nice swim beach, along with canoeing, kayaking, and paddle boarding. You can bring your own and play on Big Soda lake for free (must have day pass), or you can rent one. 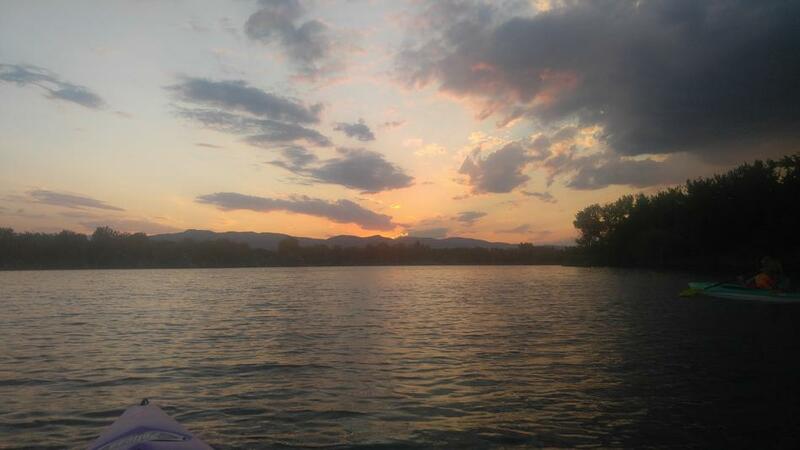 Little Soda lake offers ski and wake boarding lessons…again at a price. The larger Bear Creek Lake reservoir is open for fishing and boating (10 horse power limit). All in all, we love it here. Nice spacious sites, beautiful countryside and trails. Many trails are concrete and provide excellent bike riding, which many folks take advantage. Bear Creek Lake Park provides a convenient place to be, only 10 miles from Lakewood High School to watch our darling grand daughter (Faith) play 5A volleyball. So fun. 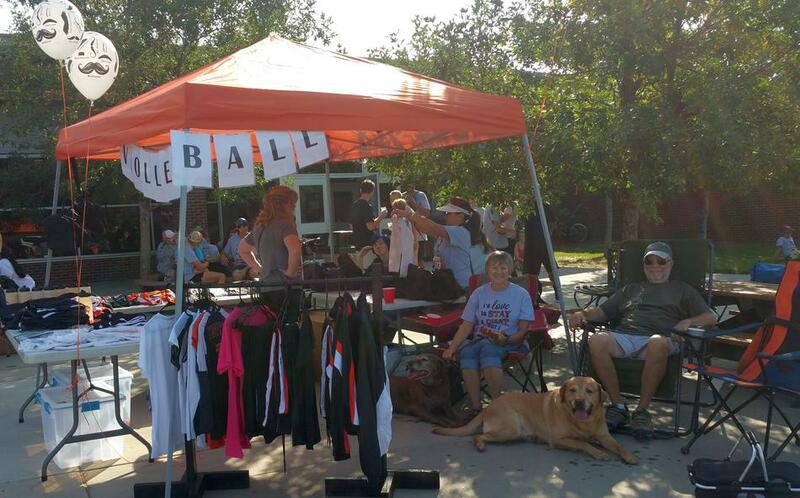 Her mom, Shannon, is very involved as president of the booster club, and we were able to assist her fund raiser booth at the Tiger Prowl. We mostly watched their 2 mutts…ahh..dogs. Tomorrow, Thursday September 14, we move back to Loveland RV Resort in Loveland. It will not be as convenient for Faith’s volleyball games, but we’ll be back near sister Cheri and a more convenient to Grace Coach Lines when Ed has a driving job. Saturday, Sunday, and Monday coming up. But generally he has time to do retired person stuff. Future plans now include returning to Big Creek Fish Hatchery near Astoria, OR next May and June. We’re pretty excited about getting back there and seeing the new friends we made. After returning to Colorado from Wyoming, we were able to park at St. Vrain State Park . But we were limited to 3 days as State Park spaces are reserved far in advance, especially weekends, and zero spaces were available. However, Grace Coach Lines (aka/dba Dakota Bus Service) were fine with us pulling in to one of their bus slots for 2 days while waiting for our reservation start at Bear Creek Lake Campground. Ed drives charter occasionally for Grace, so he was able to get the okay. Actually it was quite nice, with 20 amp service and concrete pad. Thank you Phyllis, Mike, and John. NOTICE: The large “D” and Mobile Suites across the cap is gone, and we are now: In Search of Fun. 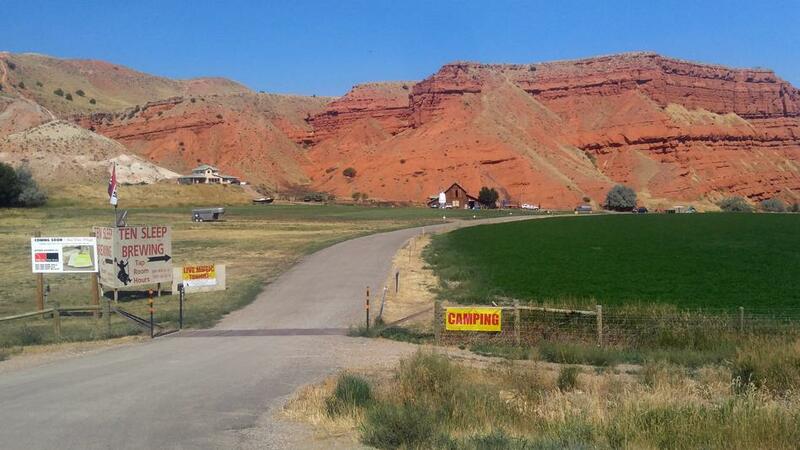 After 2 days at Grace Charters, we had 5 days reserved at Bear Creek Lake Indian Paintbrush Campground. 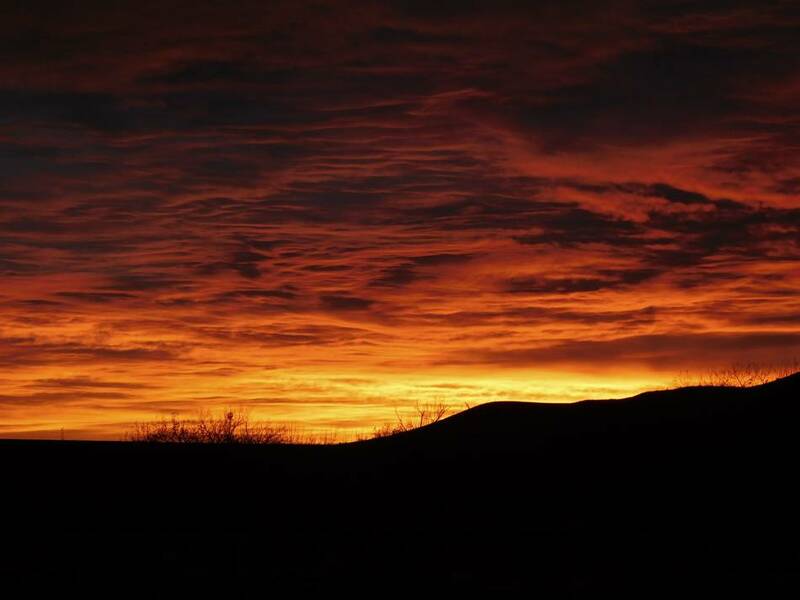 The Campground is 2 miles from the Bear Creek Lake Regional Park entrance on an asphalt road that winds around the Soda Lake swim beach and marina, horse back riding stables and archery Range. 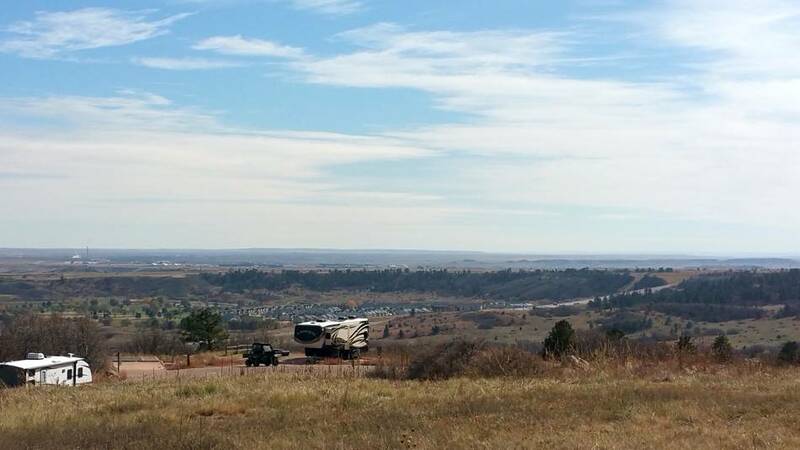 The campground has 47 campsites, which is just a small part of the 2600 acre area that also includes miles of trails, as well as Bear Creek Lake. 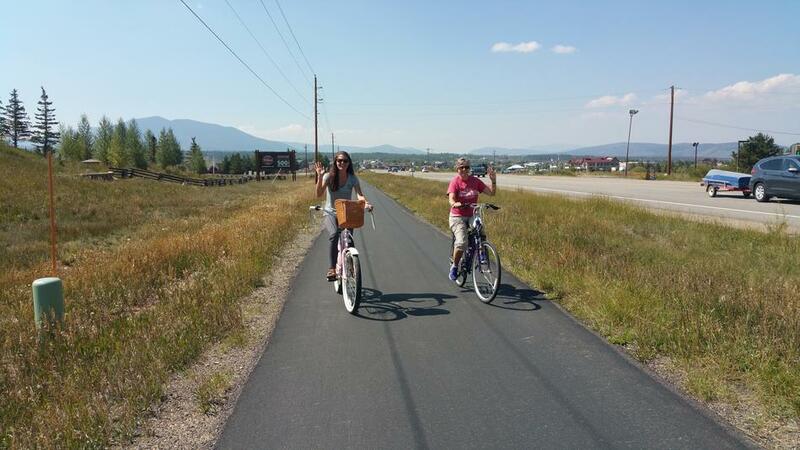 One morning we rode our bikes on a paved path for about 4 miles to Morrison for breakfast. 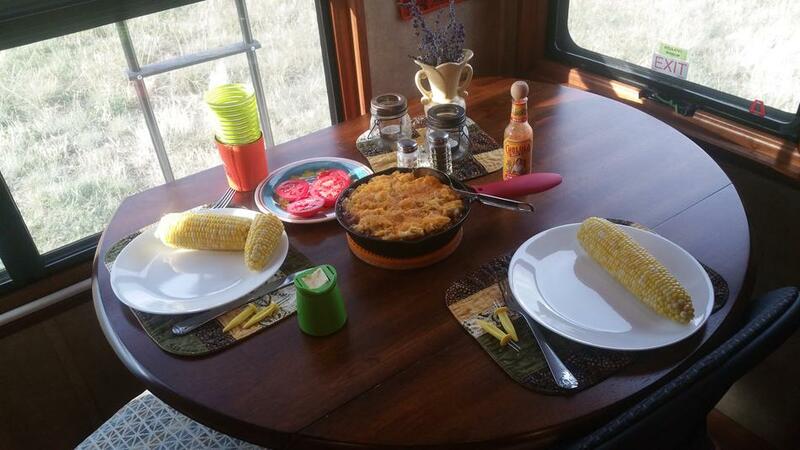 Connie tried out the new skillet we recently purchased at the Thermopolis Cafe to make a delicious Shepherd’s Pie. Life is good. 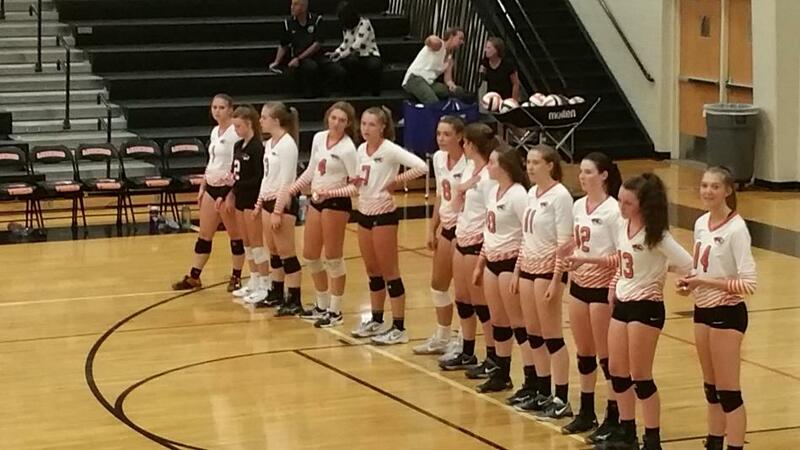 Our time in Colorado is mainly driven by our Grand Daughter Faith’s high school volleyball schedule. Faith is lined up with her team for introductions before a game. As a starting team Libero, her jersey must be an off color from the rest of the team. We are proud grand parents indeed to see Faith starting as the only sophomore on a 5A team. 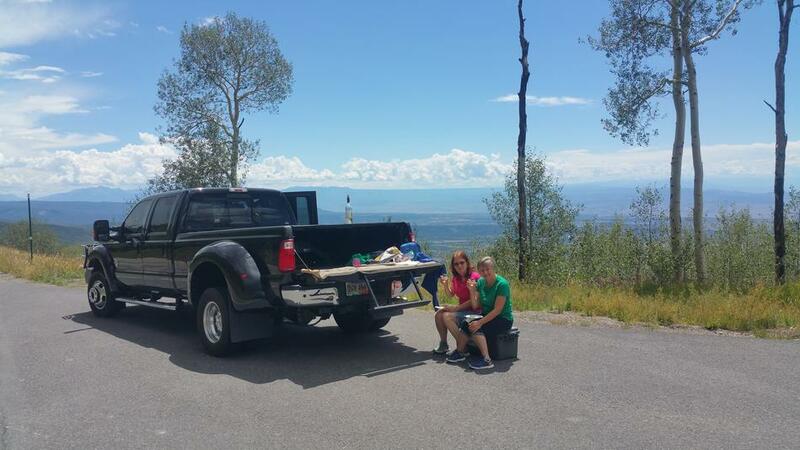 Saturday September 2, we drove 67 miles over Berthoud Pass to our friends place in Fraser. Brian and Angie have a lovely home with a view of the Winter Park Ski area. They were very hospitable, providing us with 20amp service, WiFi, great water if we needed it, friendship and shared meals. A Labor Day weekend to be remembered. Thanks Brian and Angie. After arriving, we got on our bikes and followed Angie down to the paved pathway to Winter park, and the Hideaway Brewery where Brian works part time. We were blessed with beautiful weather the entire Labor Day weekend. 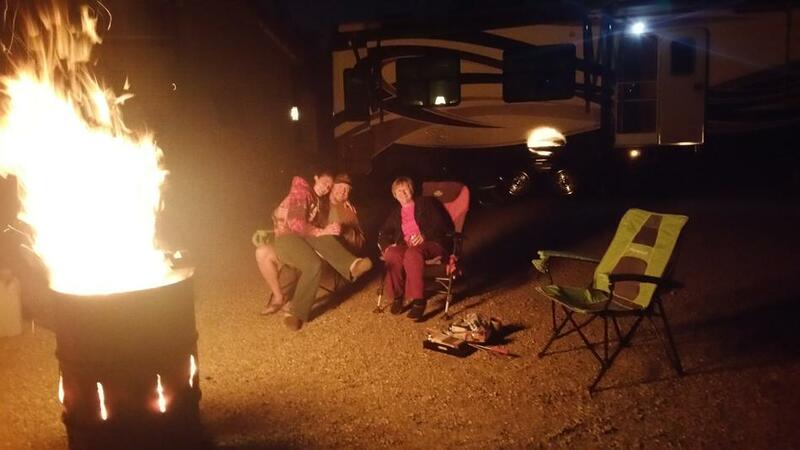 We also enjoyed sitting around the barrel fire in the evenings to chat and roast s’mores. Having the fire in the barrel prevented all the smoke smell and was easier to contain. We didn’t miss our popcorn/movie routine at all. Brian not only works the bar at the Hideaway Brewery, but also does a lot of the brewing. 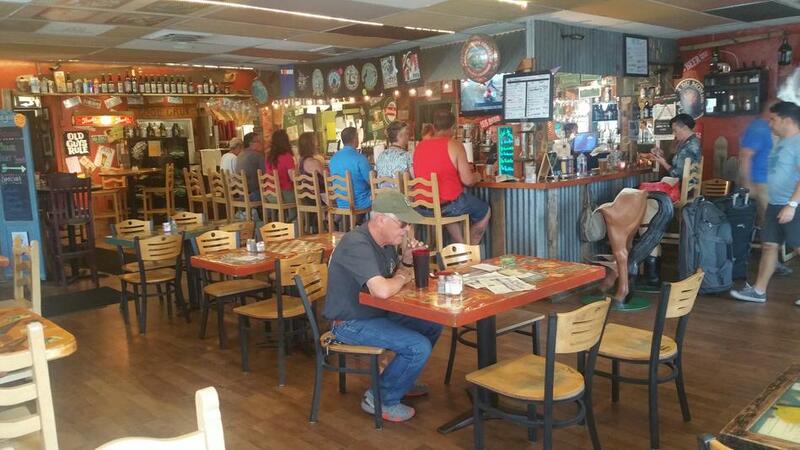 Their signature beer is BruBrew IPA. Very good. While Brian had to work at Hideaway this September 4th Labor Day, Angie was eager to learn how to sew. Connie was more than happy to oblige. Angie and Brian’s Great Dane Lucy wasn’t quite as interested and was happy just waiting for her walk time. We head back to Bear Creek Lake Campground Tuesday, September 5. 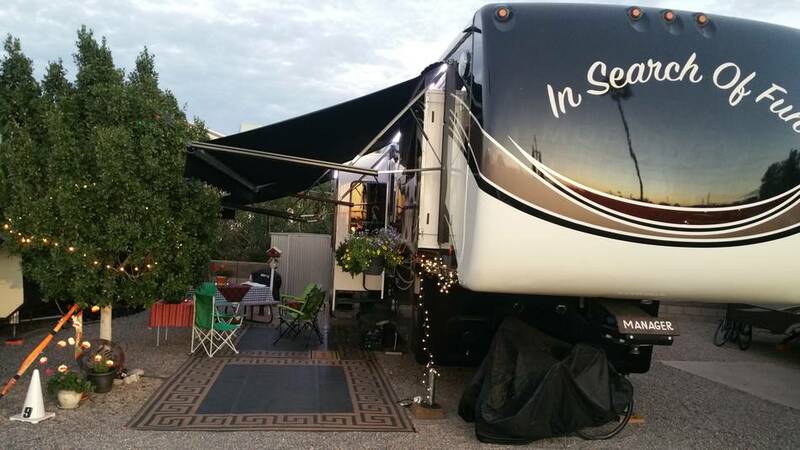 We’ll be there until the 14th when we move to Loveland RV Resort for a full month! 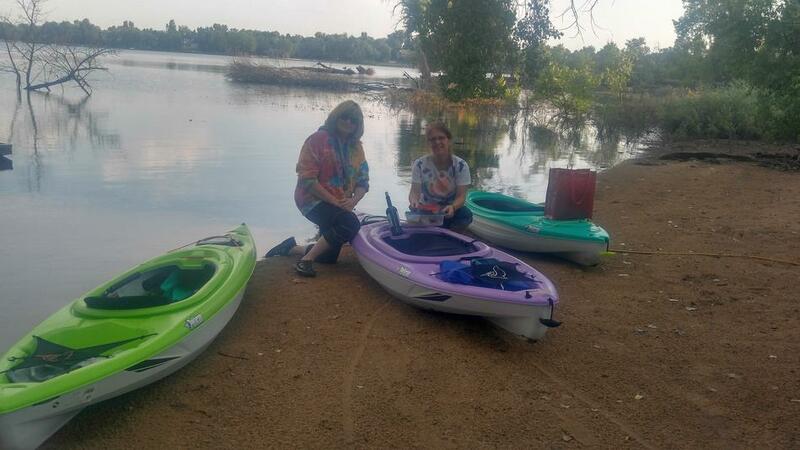 While Ed was driving charter bus on a Mormon trip, Connie and Cheri met Debbie for a little Kayaking on a small lake by Debbie’s home on Tuesday August 1. They had a great time. Thanks to Debbie for providing the kayaks. The girls don’t go anywhere without their wine. Can you spot it? 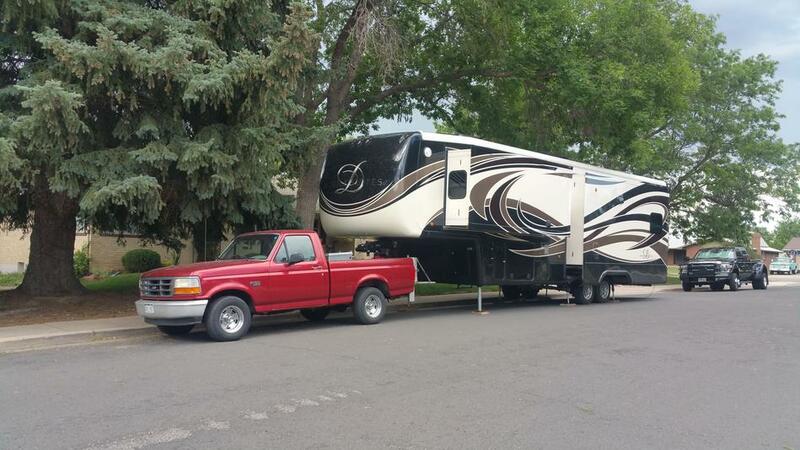 August 11 through the 14th we pulled the trailer back to Grand Junction. Cheri tagged along this time and we parked at the RV Ranch in Clifton. A very nice park. 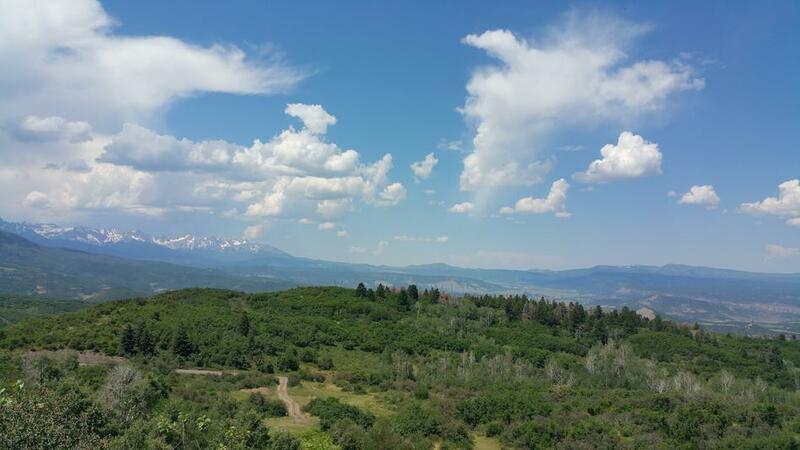 Cheri was contemplating a move to the Western Slope, so we did a lot of driving around to look over real estate, stopping a some wineries along the way of course. 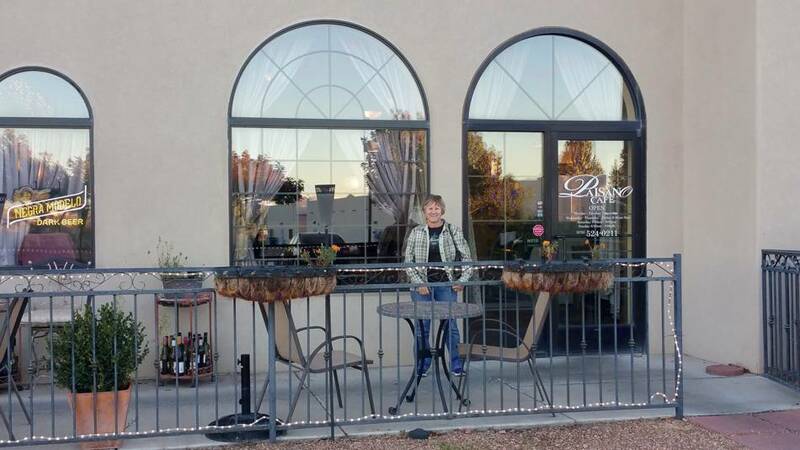 Visited Grand River Winery in Palisade again (first picture), as well as several others. Palisade is great wine…and peach country so we had to buy a box of peaches while we there too. Stopped for a little impromptu lunch on a fantastic trip to the Grand Mesa. Spot the wine? 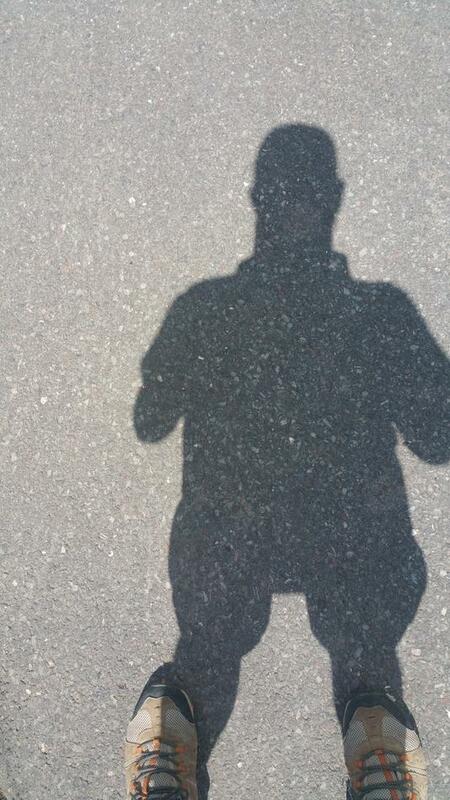 Ed took his first selfie. Enjoyed some incredible views to the valley below. 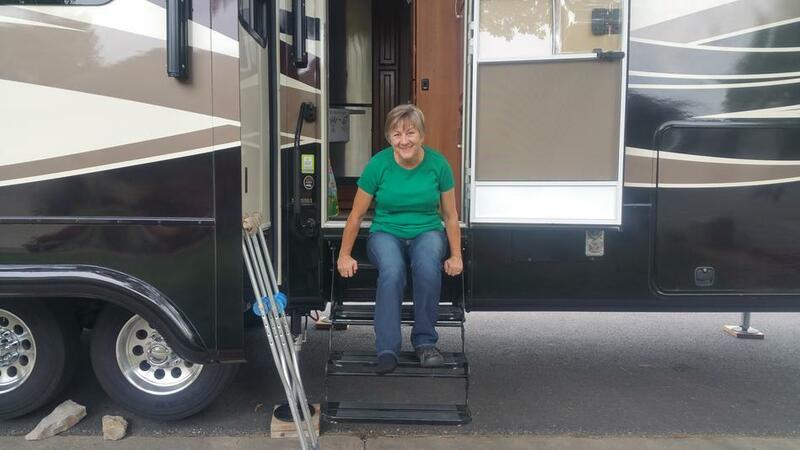 We pulled the trailer back over I70 on Tuesday August 15, dropped Cheri off in Loveland and continued another 125 miles to Wheatland, WY. We love Wyoming (minus the wind of course). They are very RV friendly. We parked for free (donation) at Lewis City Park. They even provide 50 amp service! A nice evening after the long drive over the mountain. 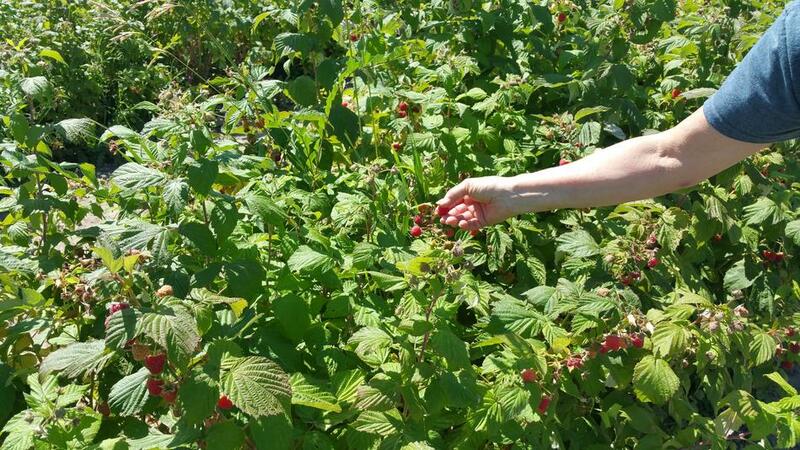 Wednesday, August 16, we traveled 216 miles to the DeLight Raspberry Farm near Shoshoni. A real hidden gem we discovered on Harvest Hosts. Raspberries were ready and thick. We picked 2 pounds at $4 per pound…our total expense for staying there. We ate a lot and froze some so we can continue to enjoy. From Shoshoni we traveled a short distance (126 miles) to Cody, WY, stopping for a great breakfast at the Thermopolis Cafe. They served our skillet breakfast in a 8″ Lodge skillet, and gave us an extra plate so we could split it. We’ve been in search of a good seasoned small skillet, so Ed asked if we could buy it! Wow, surprisingly, they sold it to us for $5. 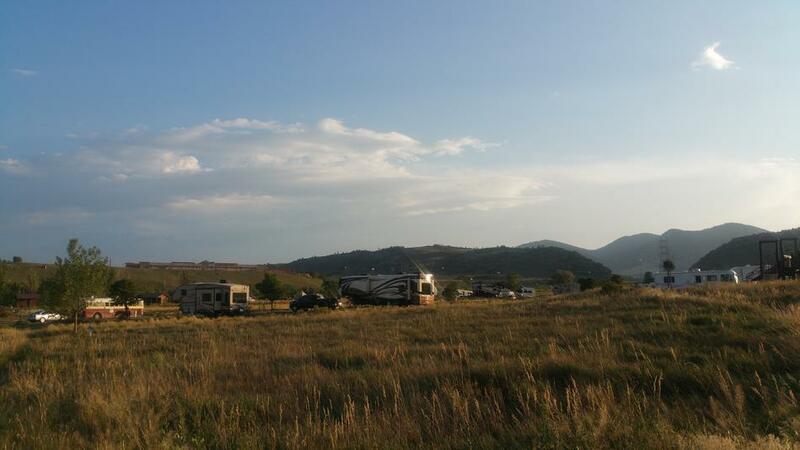 We stayed at Parkway RV Park while in Cody. Quite nice and very reasonable, especially as the Eclipse frenzy was building. 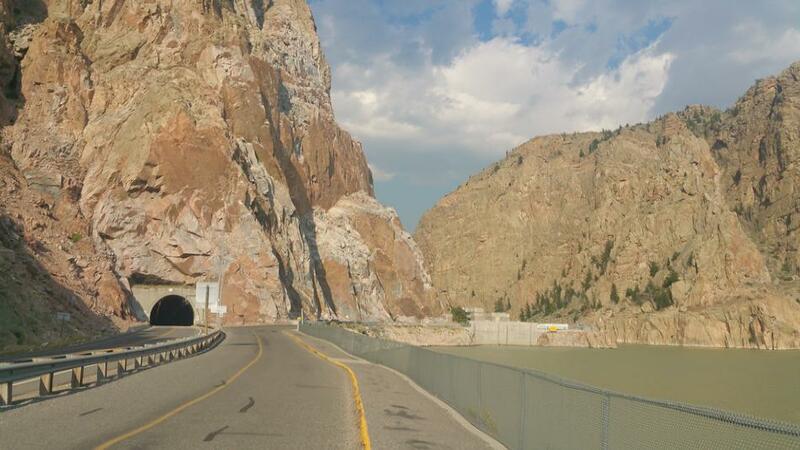 After dropping the trailer, we drove 6 miles west of Cody toward Yellowstone on US Highway 14 to see the spectacular Buffalo Bill Dam (formerly Shoshone Dam). 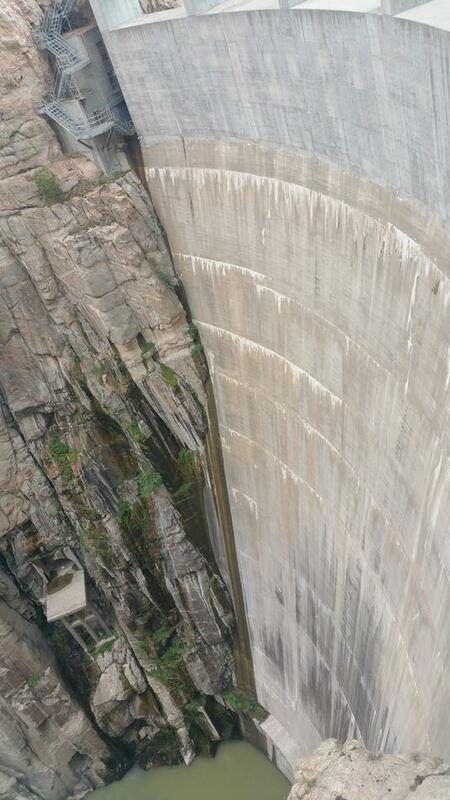 Standing 325 feet high, it was the tallest concrete dam in the world when completed in 1920. Wyoming weather was perfect for strolling around downtown Cody a bit. Connie’s ankle is nearly totally healed now. 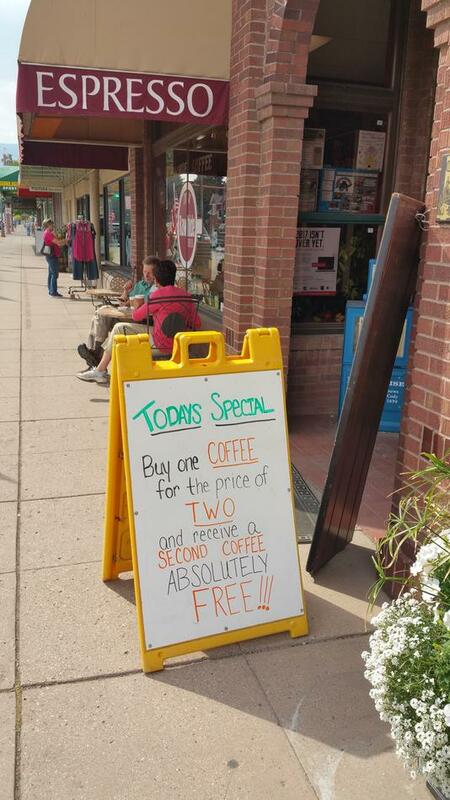 Ed admired the clever special offer on the sandwich board at a local coffee house. Of course, a little walk demands something cool and refreshing. 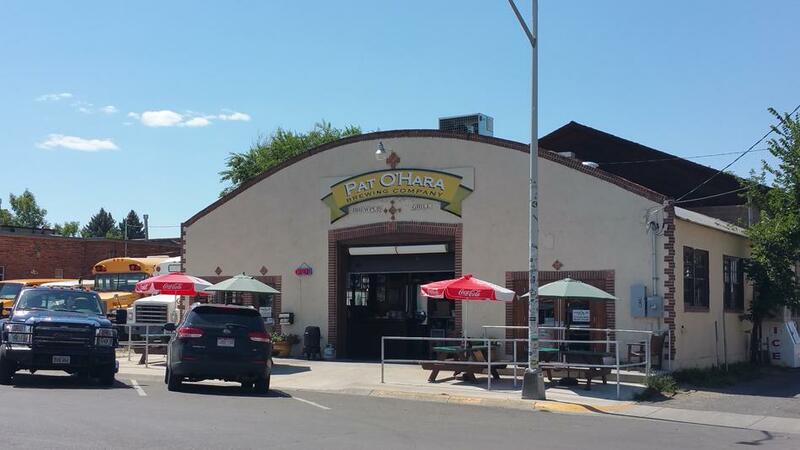 Pat O’Hara’s brewery provided what was needed. Very quaint and Cody like. 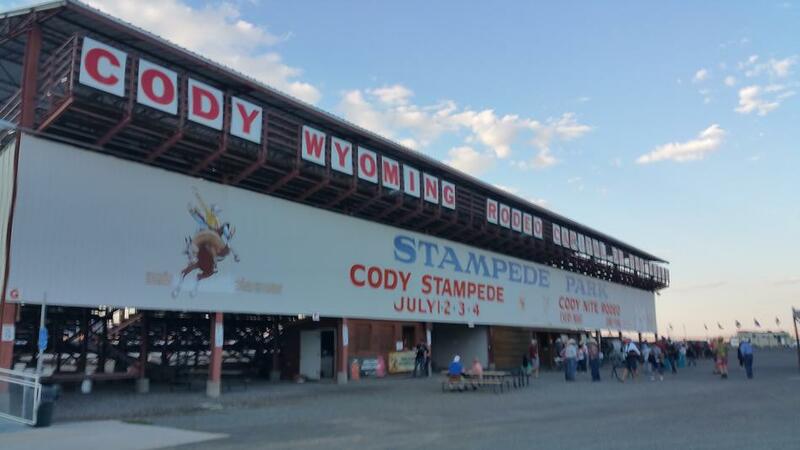 Friday was Cody Night Rodeo time. They do a great job. 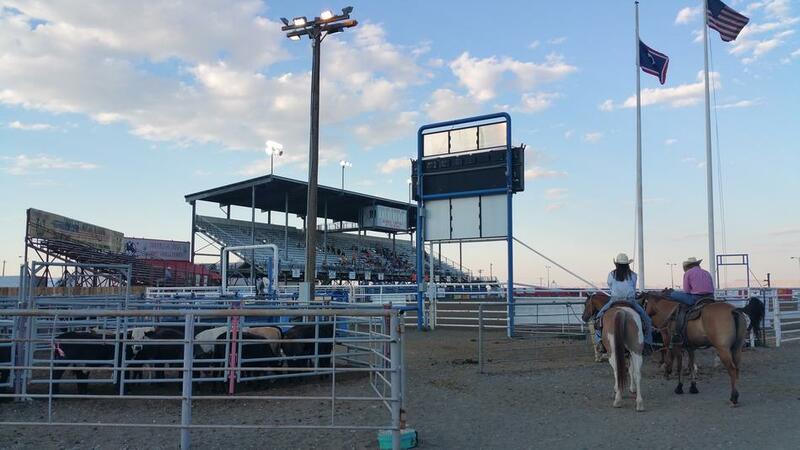 Rodeos most every night during the summer, keeping the tourists happy as they search for “authentic” Buffalo Bill related venues. 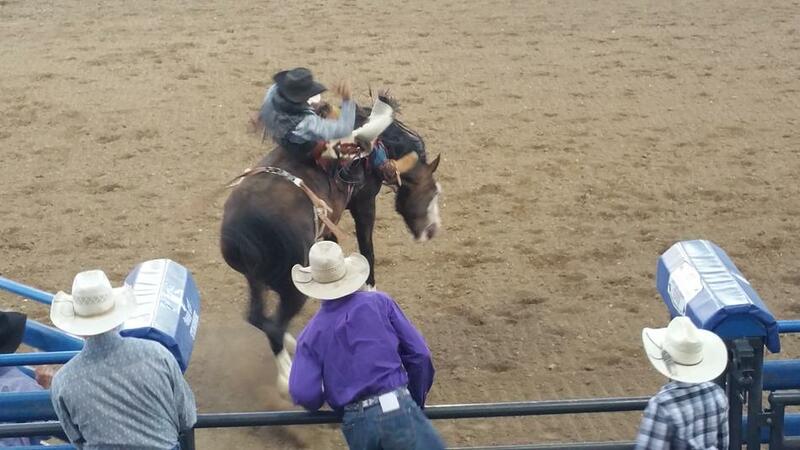 We sat directly behind the chutes so were able to see cowboys mounting their broncs and bulls…and getting bucked off. It was a fun time. We crammed in a lot for only being there 2 nights. 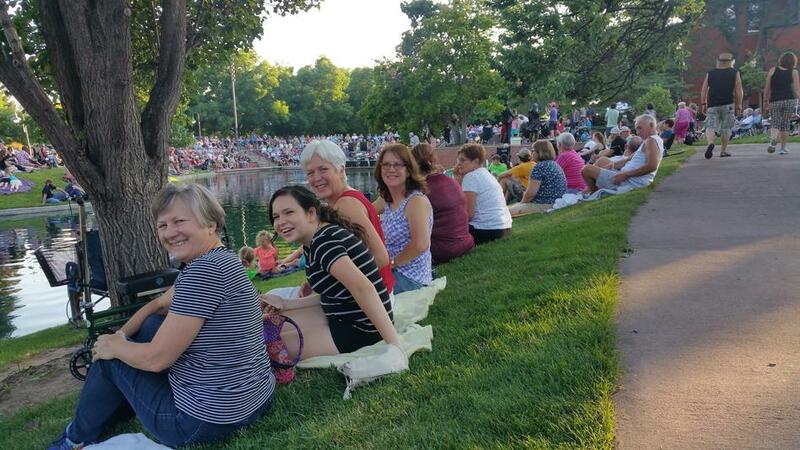 To help relax, we enjoyed a concert in the park. A real highlight of our stay was a visit to the nearby Heart Mountain Japanese Confinement site. 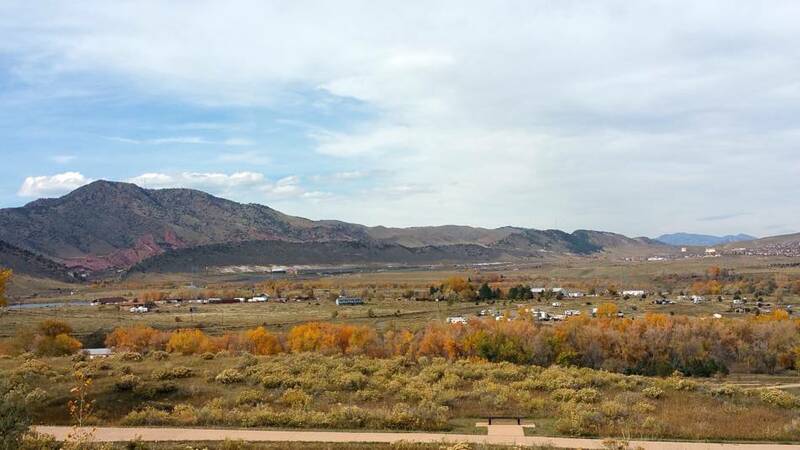 Heart Mountain can be seen in the lower picture, hence the name of the camp. 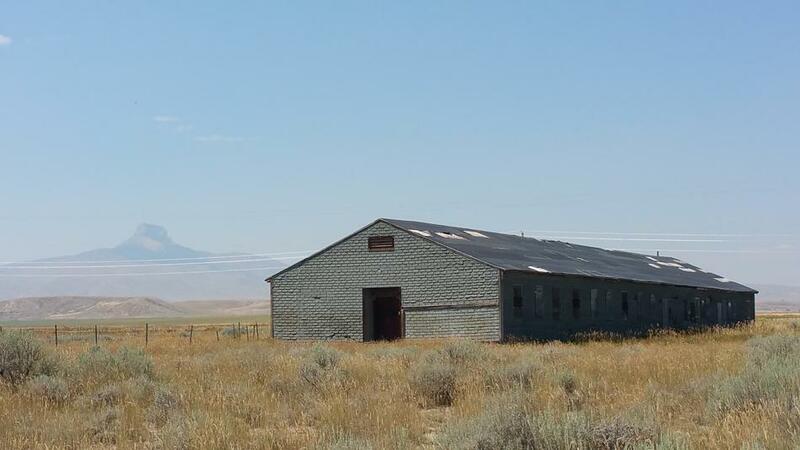 It housed over 10,000 Japanese between 1942 and 1945, making it Wyoming’s third largest city. Many were Americans. An incredible and well done interpretative site. We hooked up and pulled out of Cody by 8am Saturday, heading for Gillette for a few more days of F.U.N. 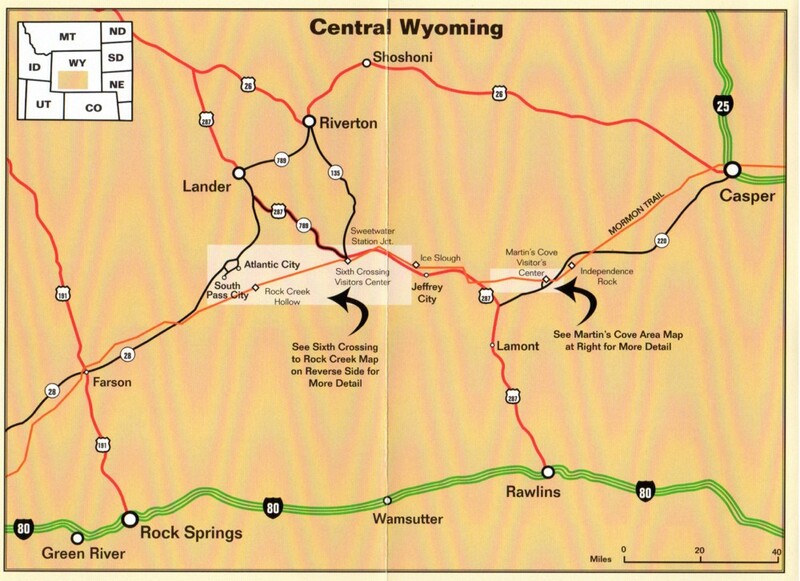 Traveled via US highways 20 and 16 through Greybull, Basin, Worland, Ten Sleep and Buffalo. 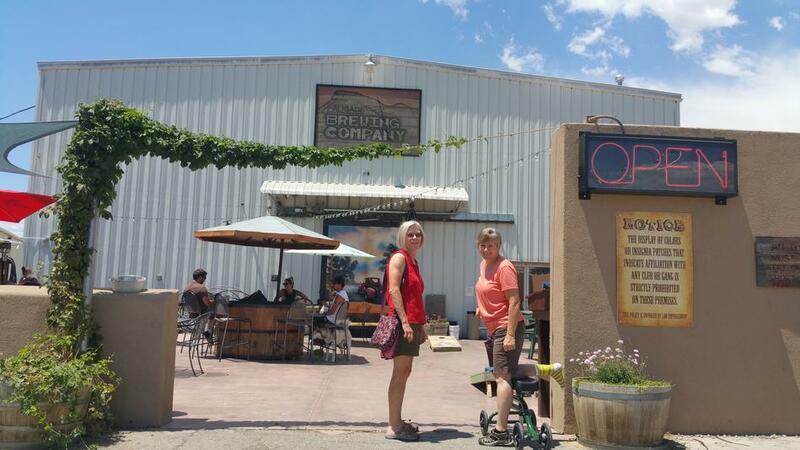 Ten Sleep is a delightful Big Horn Mountains foothills town (pop 250) that boasts a brewery on the edge of town. 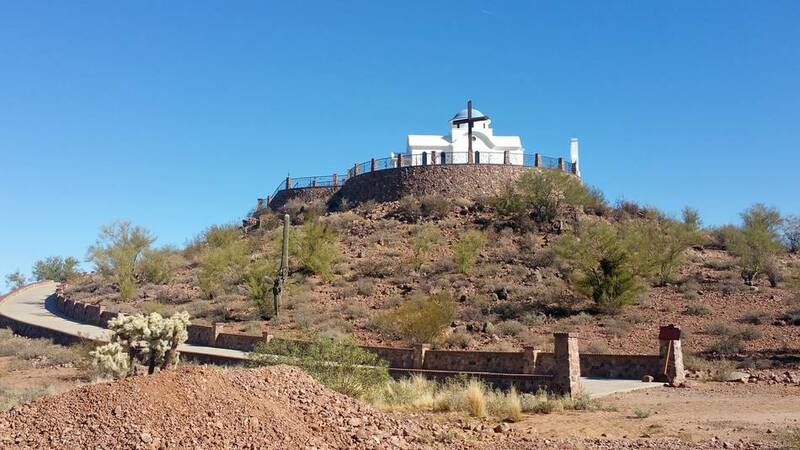 It is located on the edge of a hay field picturesque setting below the red sandstone Signal Cliff. 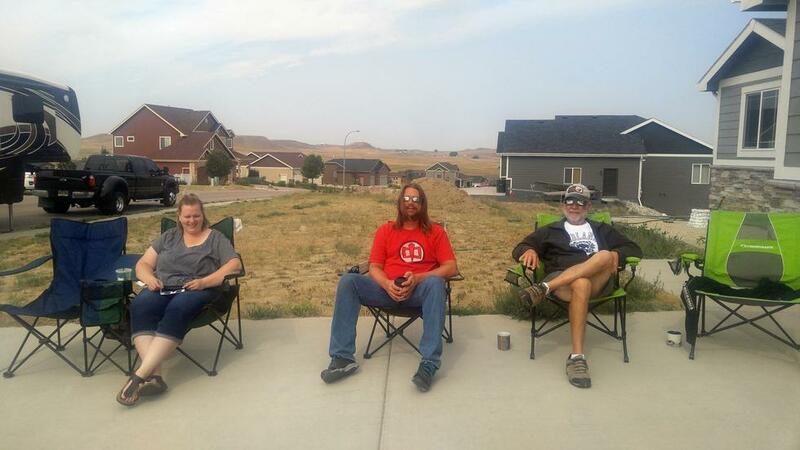 While Gillette was not in the total eclipse path, it was certainly convenient to sit in our son’s driveway to view the 98% eclipse on August 21. Even at 98% it was fantastic to view as many others can attest. Son Shelby even had our viewing glasses ready for us. Shelby is the one that looks like Chewbacca. Grand daughter Brittani is on his right. Not sure who the other dude is. 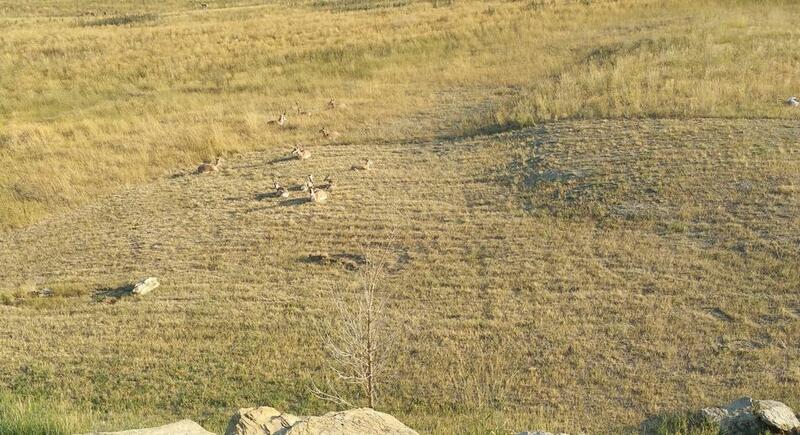 These antelope hang out in Shelby’s yard where they can be viewed off his deck. 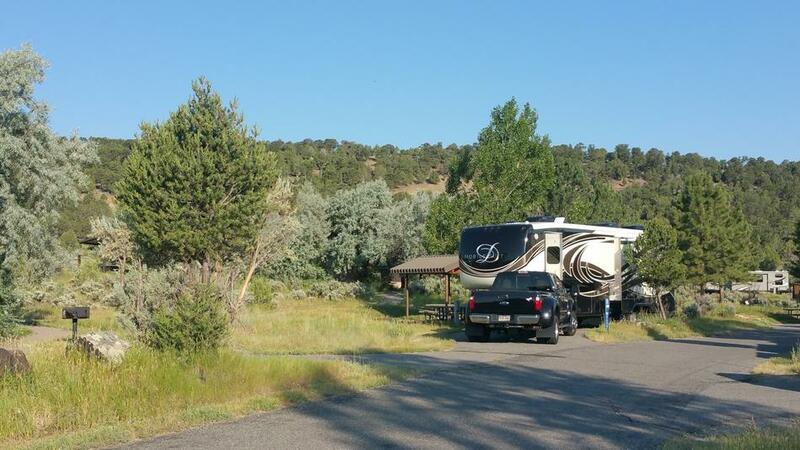 Wednesday, August 23, we head back to Colorado, parking our Mobile Suites Rollin’ Retreat to a variety of RV sites. Typical Colorado Summer…daily afternoon thunder storms. 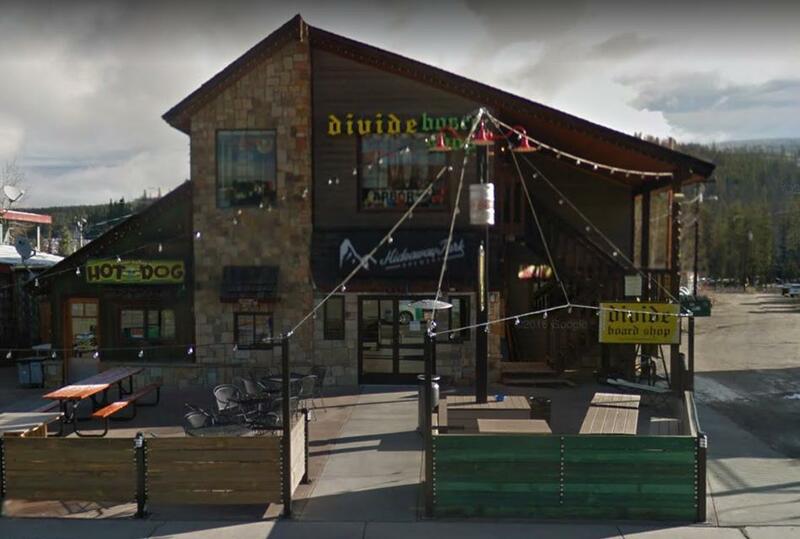 Nice for keeping Colorado green…along with the cannabis, but sure puts a cloud (pun intended) over outdoor activities. 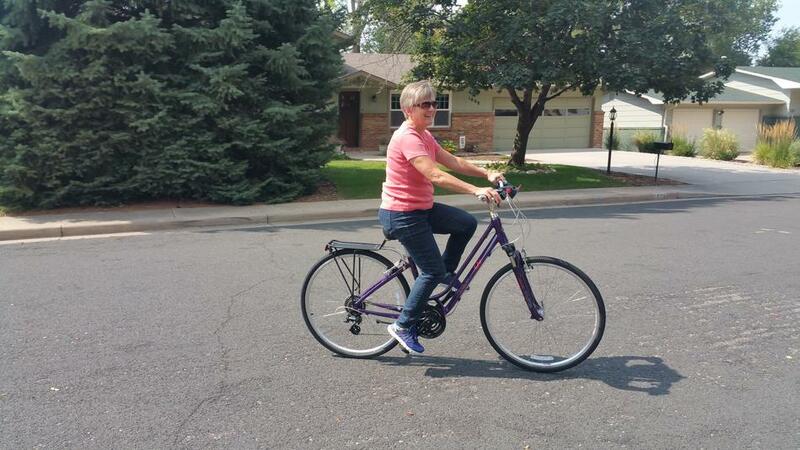 Connie got to ride her new bike a little last Sunday, but the rain and other activities has kept her grounded for awhile. Good news, however, she’s finished with PT and walking somewhat normally. We’re heading back to Grand Junction Friday (August 11) for 4 days. 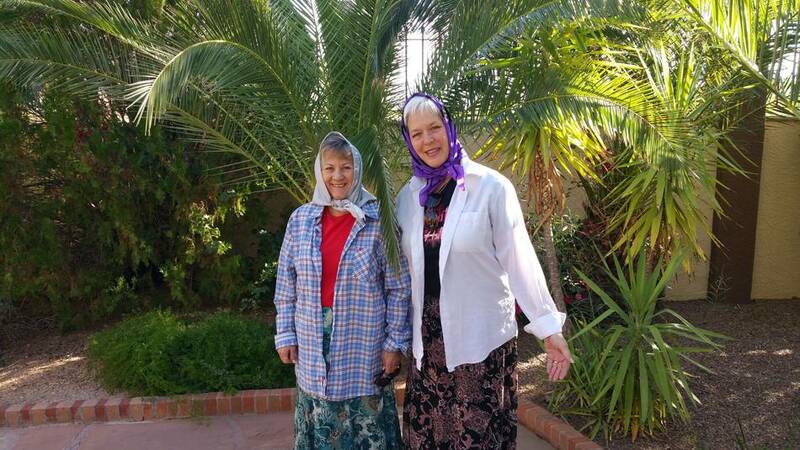 Sister Cheri will go with us. She wants to look around at some Western Slope real estate. Of course wineries and breweries too. The two girls are planning our meals with provisions from Cheri’s garden. Should be a feast! On return to Loveland, we’ll drop Cheri off and head out for Wyoming. 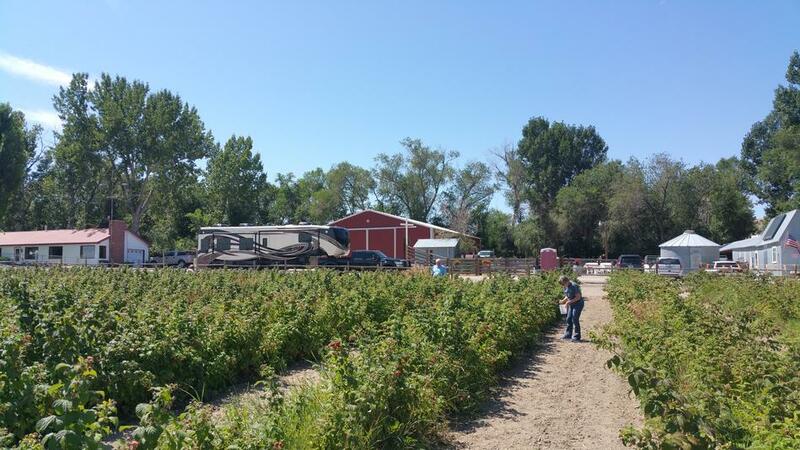 Stopping at a Raspberry farm in Shoshoni (Harvest Hosts), then Cody, and Gillette through August 22. Will be in Gillette for the Eclipse on the 21st. Gillette isn’t on the main path, so we won’t see the full effect. 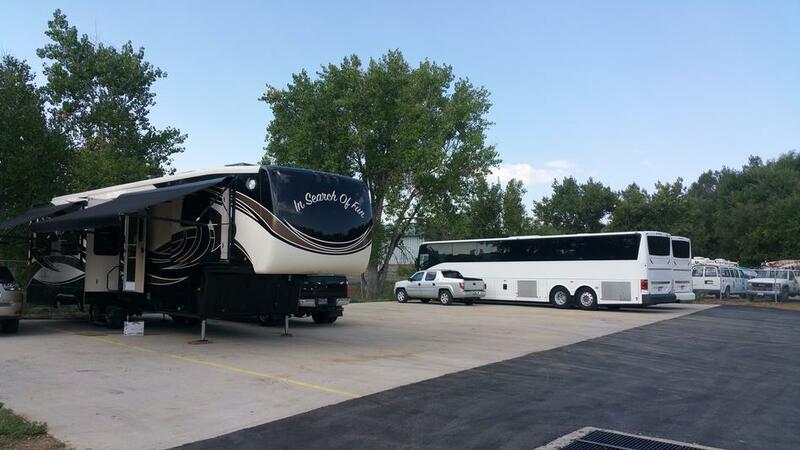 In the mean time, Ed drove charter bus, along with 6 other buses, from the Longmont Mormon Stake Center to historic Mormon Trail sites in Wyoming. We drove 300 plus high school youth and their leaders for a Pioneer experiential adventure along the Mormon Trail in Wyoming. 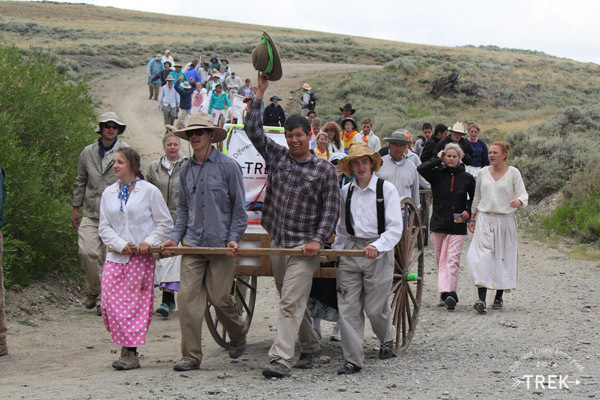 After arriving mid-day, we dropped the group at the Willie Center Sixth Crossing (Sweetwater Junction, WY) The group got in the groove pulling hand carts and camping out that day. Fortunately, the bus drivers drove to hotels in Riverton or Casper. The next morning the group loaded up and we transported them down 11 miles of dirt BLM road to Sage Creek. From Sage Creek, they pulled their hand carts the 13 miles cross country to Rock Creek Hollow where they camped. Then off to Martin’s Cove on Wednesday for more experiential trekking and camping. We bused the totally exhausted group back to Longmont on Thursday. 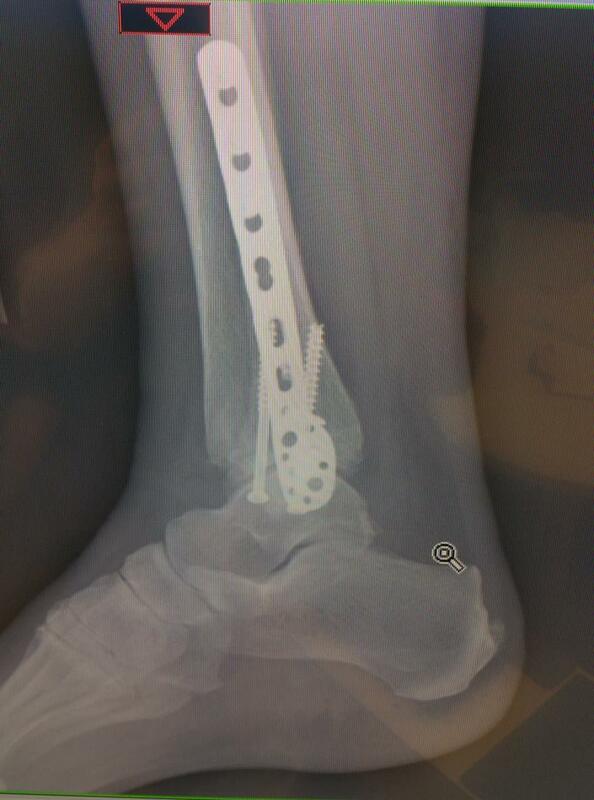 Well…the hardware looks rather uncomfortable, but Miss Connie is handling it quite well and so happy to have the go ahead to put a little pressure on her foot. 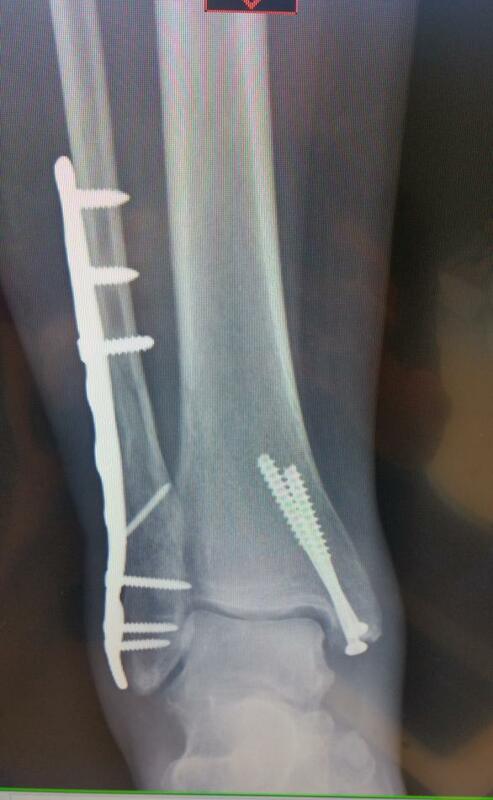 Doctor tells her if plates and screws bother her, she may elect to have them removed in a year! She can actually walk on it a bit. The new tie-on support really helps. She loves her PT guy Duane who has gotten her excited about her recovery and getting back to normal. 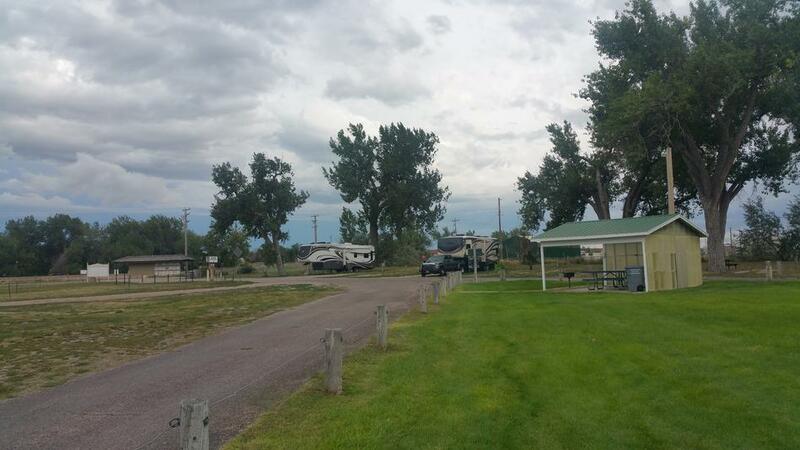 We’re holed up at Riverview RV park near Masonville, only about 5 miles from Loveland. Located on the Big Thompson River…well next to it. 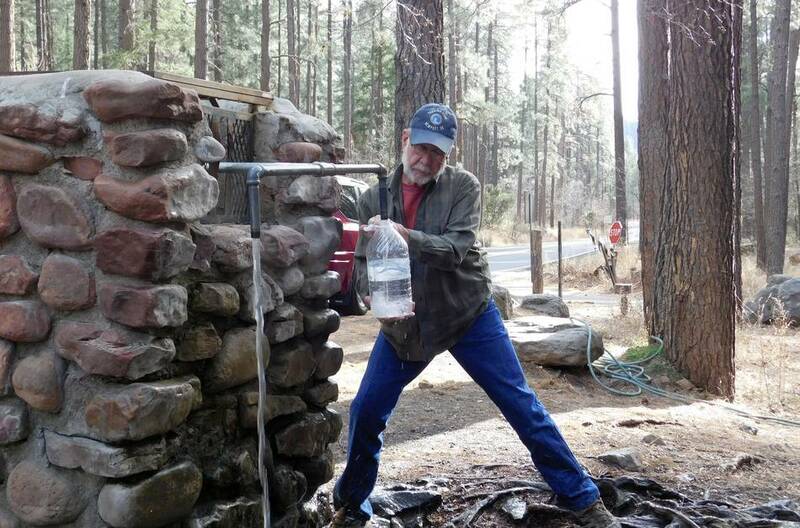 The park was severely flooded with the last Big Thompson flood back in 2013. Consequently it is either dusty or muddy, but…very shaded and somewhat secluded. We’re parked next to one of the several tiny houses they rent along with RV spaces. We were happy that we were able to book 3 weeks anywhere. Because of our broken ankle change in plans, we’re staying at a variety of places during the recovery. We’ll head back to Mesa the end of October. 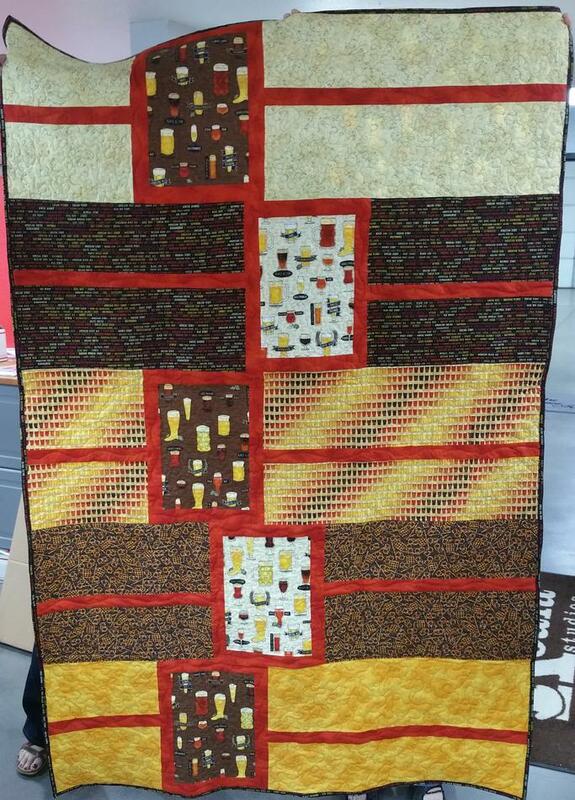 In the mean time, Connie finished this Beer Quilt, which is now proudly displayed at the Presser Foot in Longmont. Pretty neat actually. Check our quilt page for some other pictures. 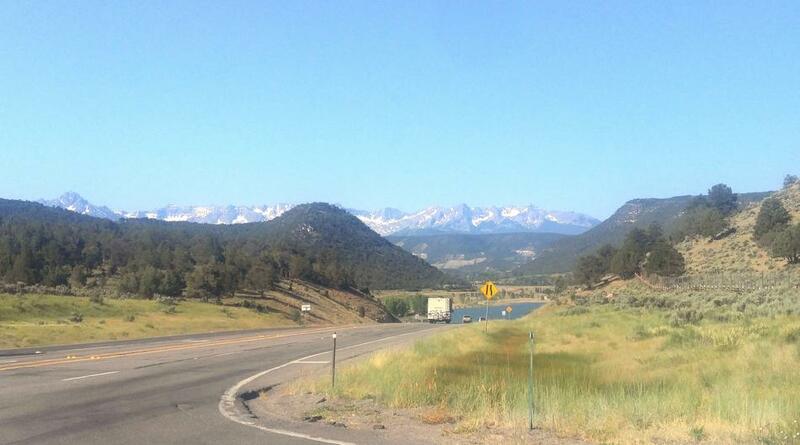 Our RV Park is on US Highway 34, gateway to Rocky Mountain National Park. It gets a lot of traffic this time of year. We pass the Buckhorn Brewery when we venture in to Loveland. 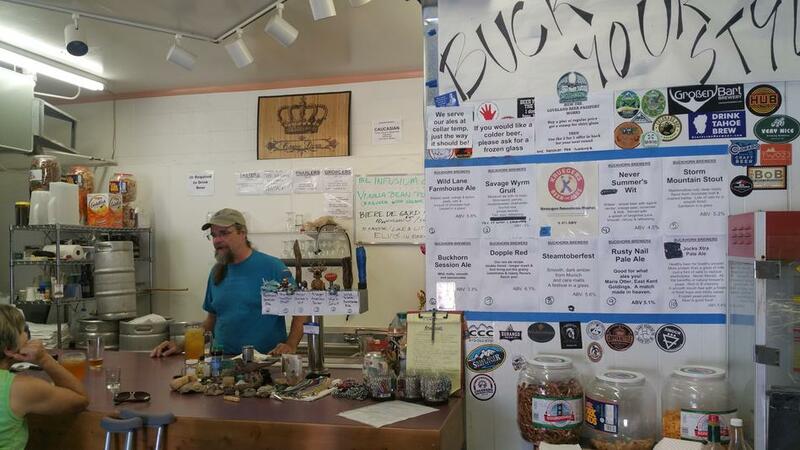 While the Buckhorn has been around about 4 years, it is still in it’s infancy, remains a nano brewery. Dave Beer (may not be is real name) loves his Gruit compilation. Consequently, so does Connie. 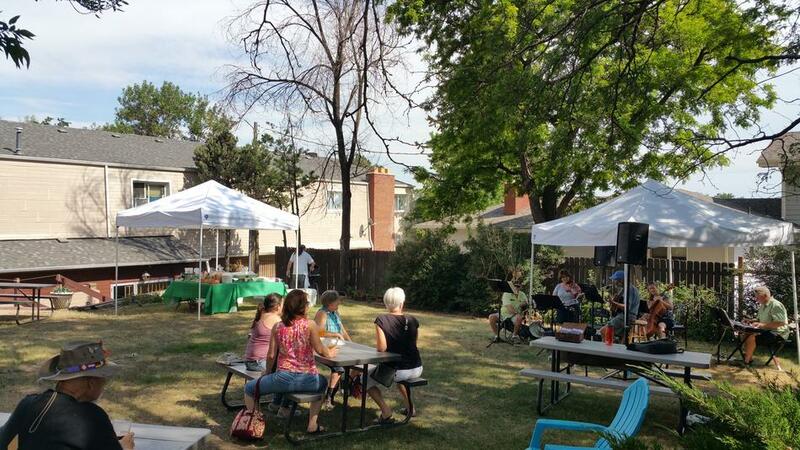 We stopped by one afternoon while the Sauter family and Mackenzie were here, for a little music in the Beer Garden. A long story about that too…but only available when stopping by and chatting with Dave Beer. We were hopeful that Obama Care would pay for this therapy bike for Connie’s recovery, but no such luck. No, really we ordered this new Giant Liv Flourish Thursday July 27 and is excited for it to arrive next week. Should help with recovery and exercise too, right? 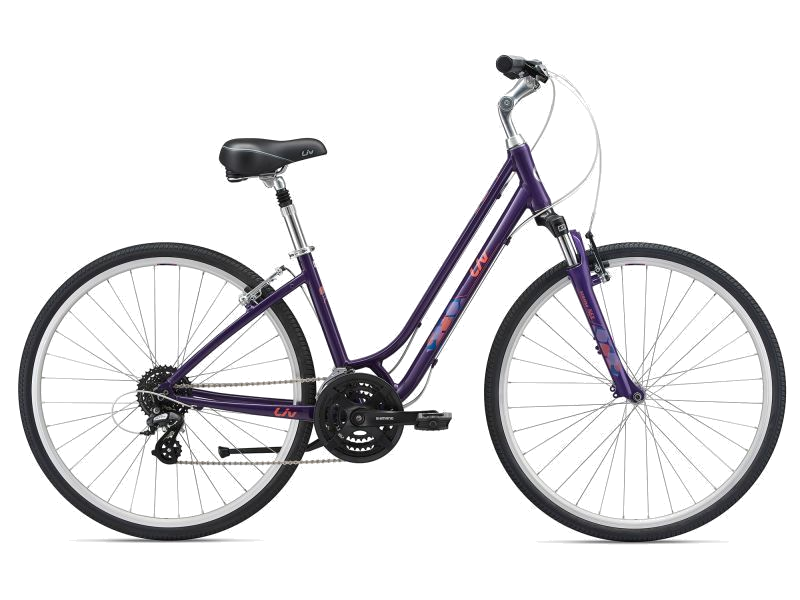 Also ordered a basket and a rear rack. Wednesday, June 5, we took advantage of our time on the “Western Slope,” and pulled our trailer the 80+ miles from Palisade to Ridgway State Park (Seems like an “e” is missing in Ridgway, but guess not). Our friends, and former co-hosts in Alaska, Texas, and Louisiana are hosting at the park and managed to arrange a “Handicap” spot for us near the restrooms and their space. 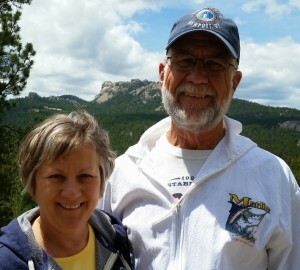 We stayed 2 nights and had a great time with Cliff and Cyndy Mills. They fed us a wonderful meal from their BBQ and roaster oven on their hideaway patio in the trees. 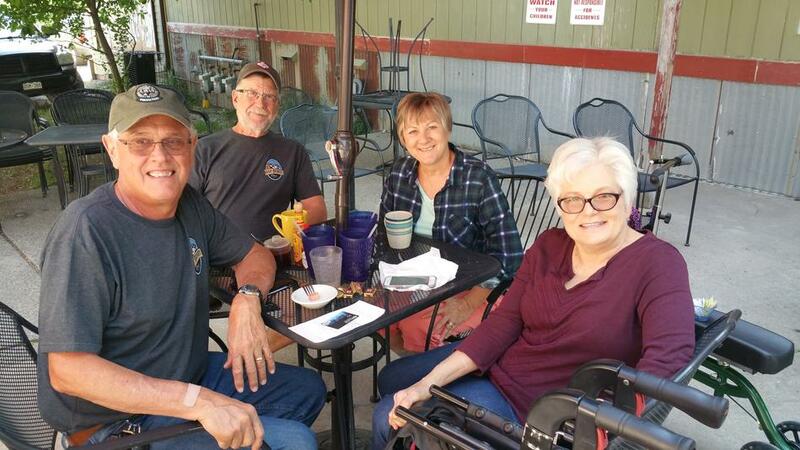 The next day we enjoyed a delicious breakfast on the patio at Kate’s Place in Ridgway. Only one negative: Connie crashed her scooter/stroller when the wheels hit a dip in the concrete walkway. She was a little scared at first…we all were…but she got back on the beast and wasn’t about to let it get the best of her. 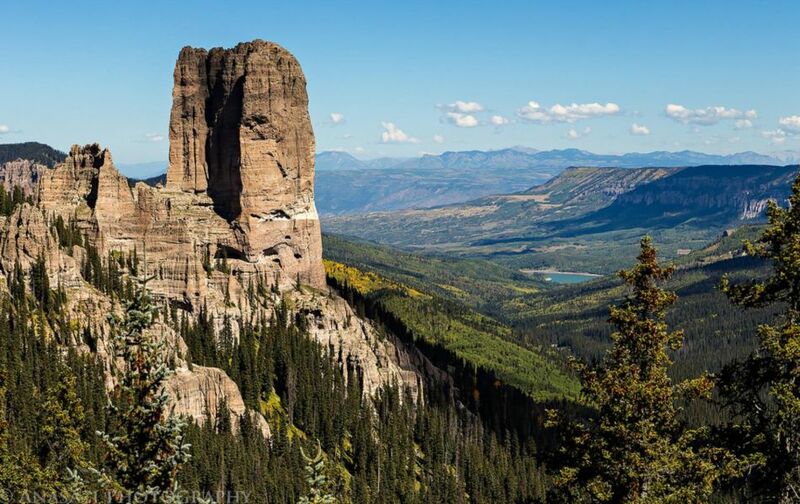 After breakfast, Cliff drove us over Owl Creek Pass where we got a much closer view of Chimney Rock on Courthouse Mountain in the Cimarron’s (picture stolen off the internet). We stopped for lunch at a National Forrest Campground near Silver Jack Reservoir before completing our circle back to Ridgway SP through Montrose. 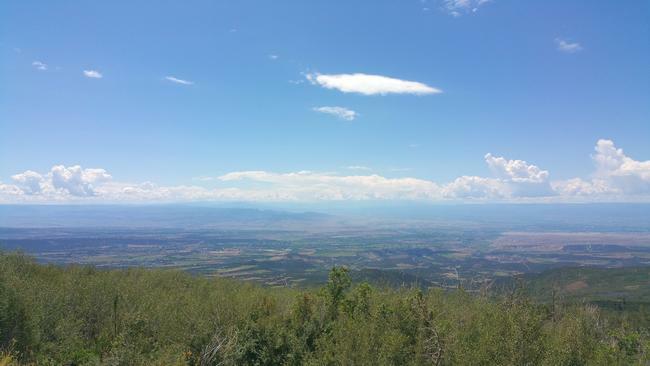 The bottom picture is the Uncompahgre Plateau range. A grand tour, thanks to Cliff and Cyndy. While the girls struggled to get up the stairs at Ladybugz Quilt Store, the guys walked across the street to the Horsefly Brewery for a little refreshment. How convenient is that! 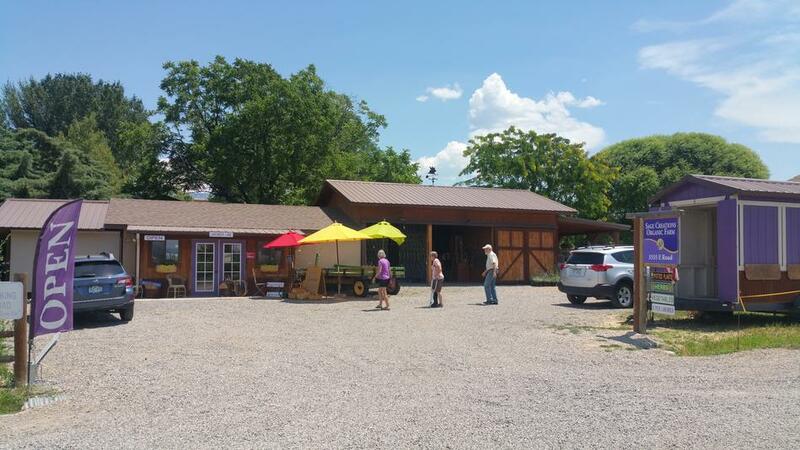 We came back to the Grand River Winery Friday June 7 and shared more time around Palisade with Jim and Connee, visiting the Sage Creations Organic Lavender Farm, Alida’s Fruits, and the Graystone Winery, Colorado’s Port House. Connie loves lavender and port, so it was a great afternoon, largely in part to our guides Jim and Connee. 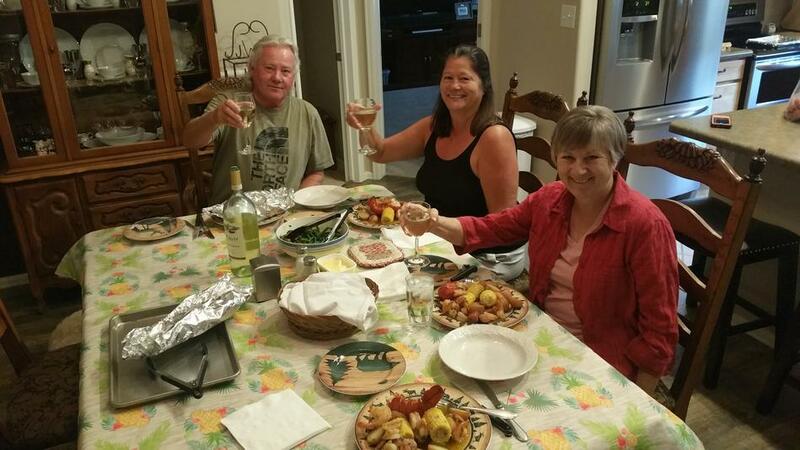 Later Friday, we were invited for dinner with new friends we met while at Twin Palms RV in Mesa…Jim and Cherlynn. And a GREAT dinner it was. Lobster, shrimp, corn on the cob, and other vegetables. Absolutely wonderful. Cherlynn prepared each meal wrapped in tin foil, and Jim cooked it up on their grill. We did have some liquid refreshments before hand of course. I think uppity ups call them libations? Some of us just call it wine and beer. Maybe a little scotch when Jim has the urge. 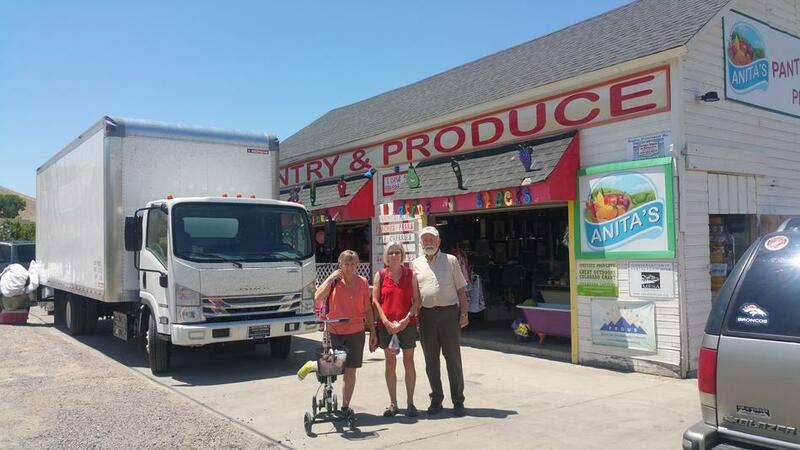 Was great visiting with them and hearing about their family and the Fruita area. We spent Friday night back at Grand River and managed to get this fun shot on the way back from Jim and Cherlynn’s. 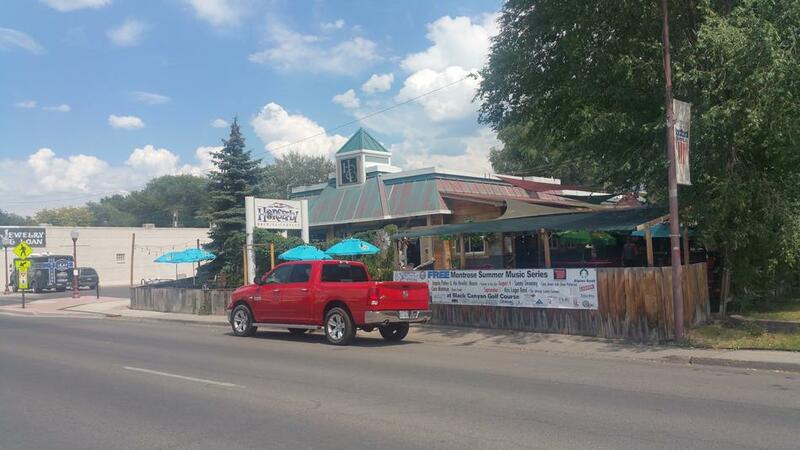 We returned via I70 back to Cheri’s in Loveland on Saturday. They still haven’t ran us off! 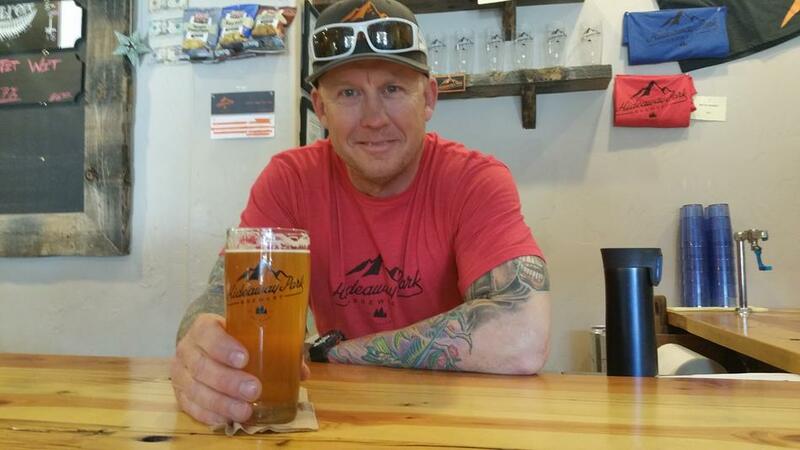 Life goes on back in Loveland. 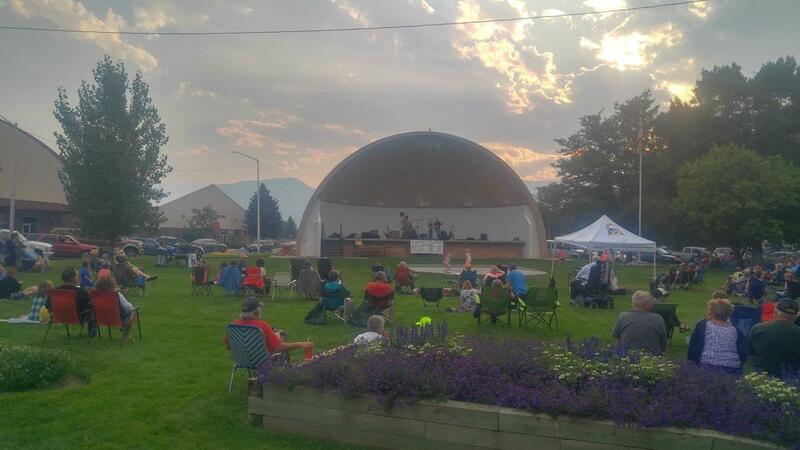 We all went to a free concert at Forte Lagoon Thursday July 13. Enjoyed Irish Folk & Celtic Rock along with many others. All of us included: Connie and her sisters Carol (white hair), Cheri (right of Carol), and Carol’s grand daughter Mackenzie (next to Connie). Mackenzie is visiting from Arizona. 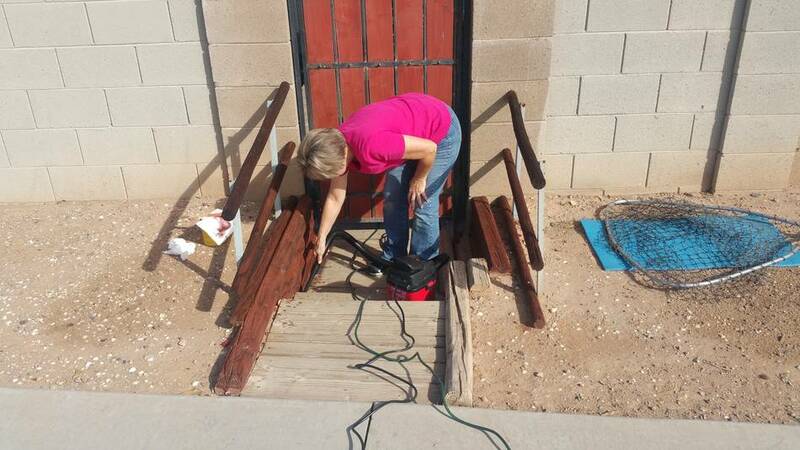 No special handicap battery operated cart for this lady. 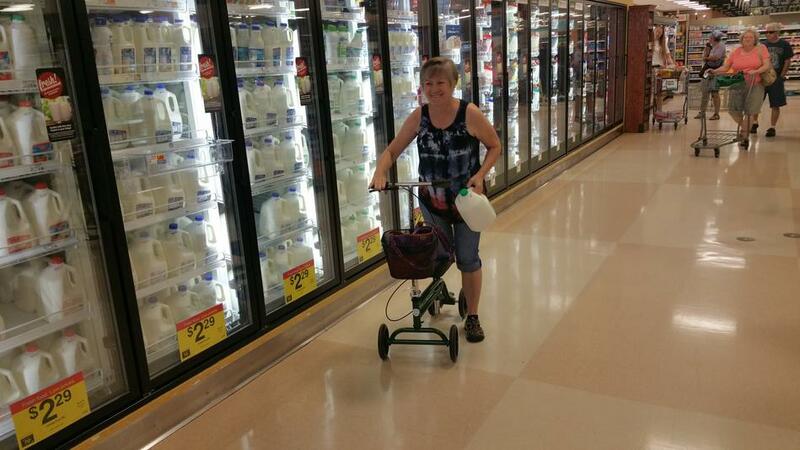 She gets down the King Soopers aisle faster that a speeding bullet…well…nearly as fast as a kid on a scooter. 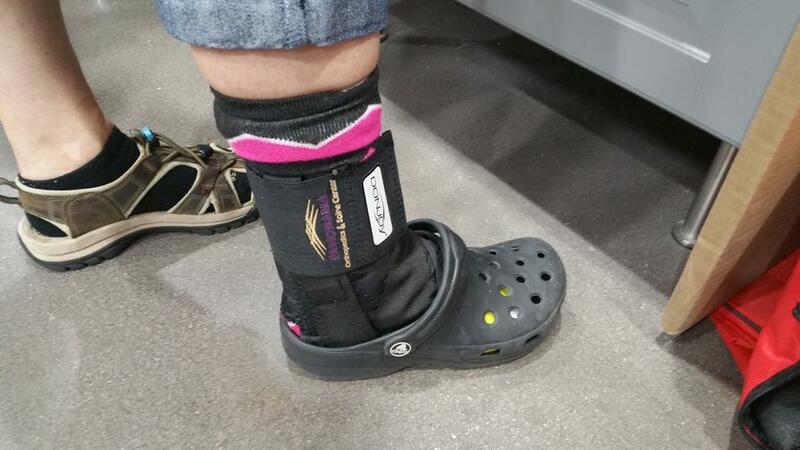 Connie’s ankle continues to heal well. She started her physical therapy and has several exercises she can do to help in her recovery. In the mean time, she’s got a new way to get up and down stairs or steps. Ed is able to pick up charter work now and then when we stay around Loveland. 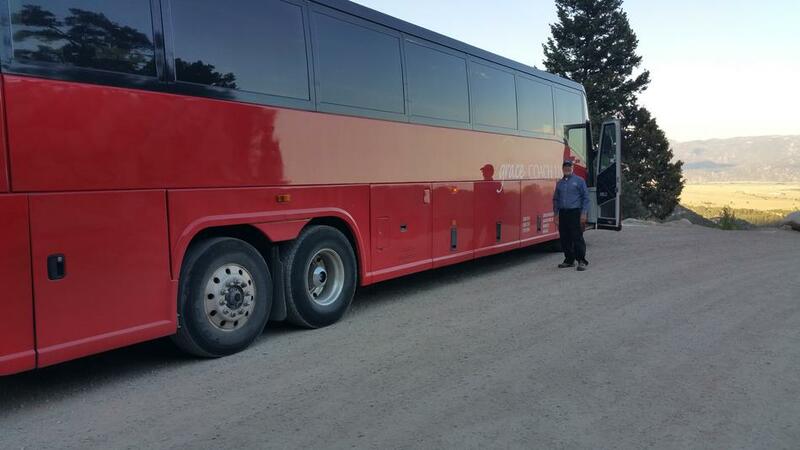 This red bus, known as Clifford (like the dog) is special because daughter Kari invested in it’s purchase, helping Grace Coach Lines secure several tours. She loved talking about “her bus.” Ed drove it to Frontier Ranch near Buena Vista and transported a North Carolina Young Life group to the Denver Airport. The lil’ Red Truck that Could…or thought it could. Cheri has nephew Marshall’s F150 in Loveland and we use it a little to avoid taking Big Blackie. Lots easier to get around. But it’s not quite up do pulling our 10 ton DRV. Big Blackie waits nearby just to rescue lil’ Red when needed. Missing our summer travel plans to Michigan, Canada, and Maine, we felt we’d like to get away for at least a short trip around Colorado. So we gathered up Connie’s stroller/scooter and crutches and headed to the Western Slope…and the heat! 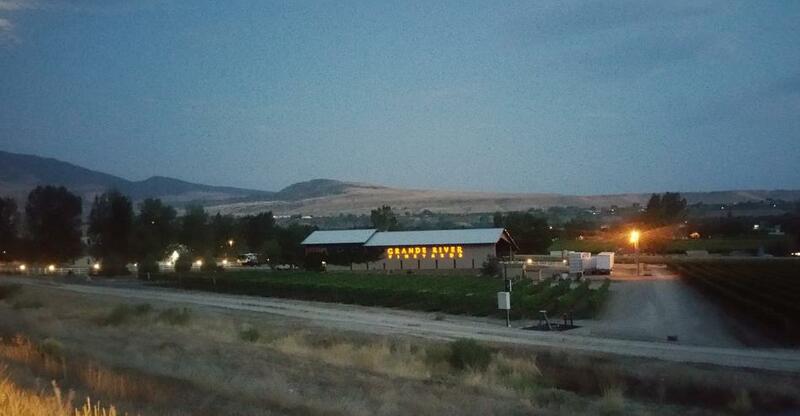 Harvest Hosts generally provides a wonderful opportunity to park at a winery for free while enjoying the area. 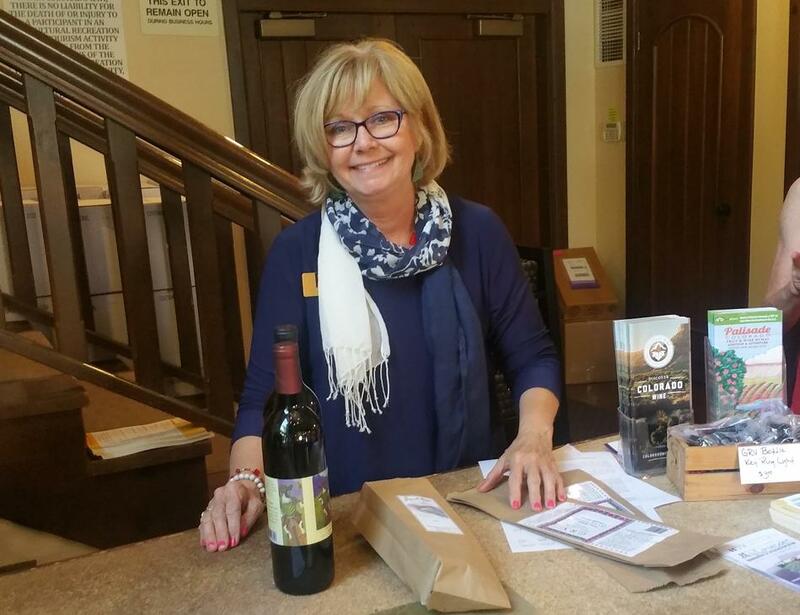 Grand River Vineyards in Palisade didn’t disappoint and were very gracious. Suzy here, along with the rest of the staff made us feel very welcome. 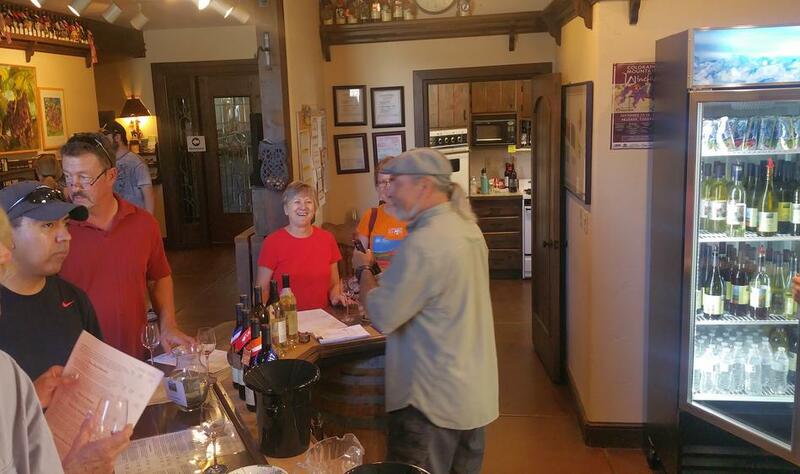 After enjoying their free tasting, we wound up purchasing 3 bottles of wine. 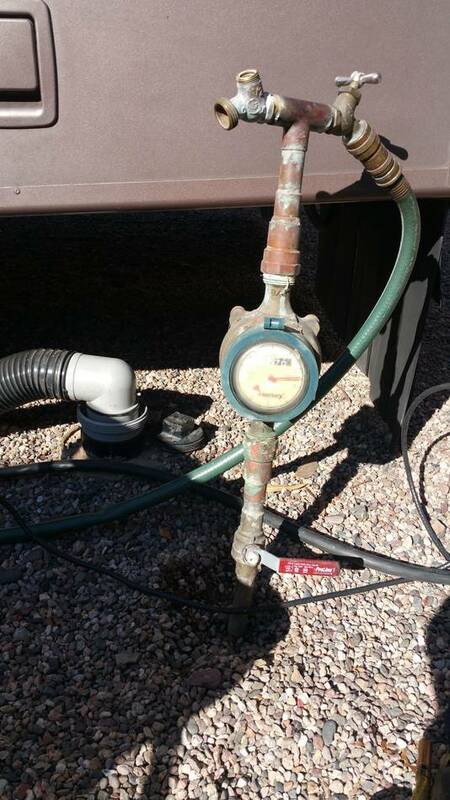 Parked with no hookups and 100° heat, it was all we could do to manage. Thanks to our fans. Old friends from Montana came to the rescue! Picked us up soon after our Palisade arrival, then off to the Palisade Brewery where they enjoyed a Dirty Hippie Wheat, and we both had an Off Belay IPA. 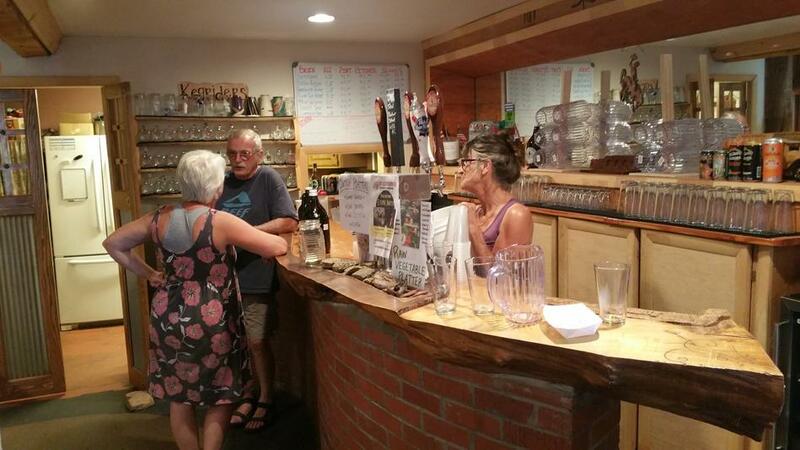 After a brief tour around Grand Junction, Jim and Connee took us to Kannah Creek Brewery for more refreshments and dinner…supper if your Roland and Susan. By the time we got home, temps were tolerable. Thanks Jim and Connee! 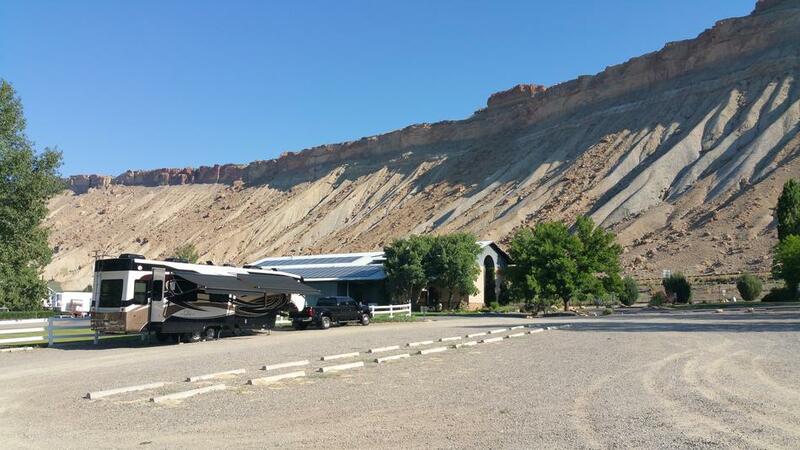 The Moffatts came to the rescue again on Tuesday July 4th and we were grateful again to not only spend awesome time with them, but to see and learn much more about Palisade, Grand Junction and Fruita. 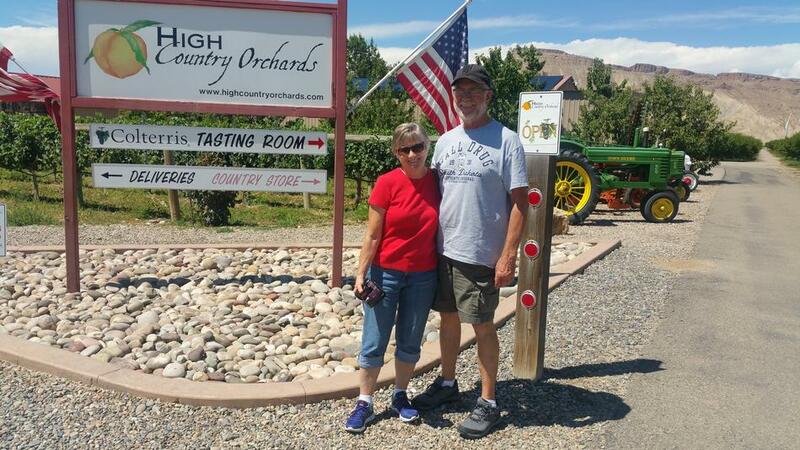 We drove around peach & cherry orchards, grand tour around Fruita, and stopped at Anita’s Fruit Stand, and a few wineries. Many places were closed due to the 4th. One last watering hole stop before heading over to the Moffatts for dinner. Surprised to find Peach Street Distillers in Palisade. Connie and Connee had to squeeze in to taste 3 of their liquors. The liked the third one, but not enough to purchase a $68 bottle. 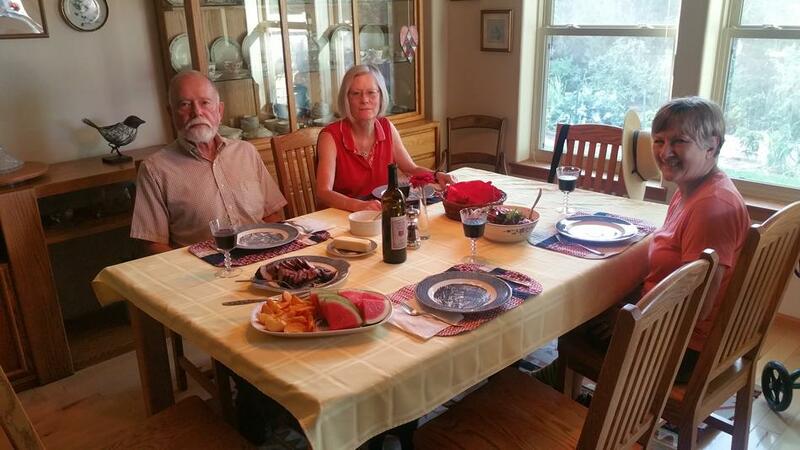 Lastly, we were invited for a delicious BBQ pork tenderloin dinner at the Moffatts. Very nice evening. We drug out our visit until 9pm, but our trailer was still very warm…well hot…when we returned. It did cool down some a little later and we managed to get a good night sleep. Now, on to Ridgeway State Park Wednesday July 5, 2017.